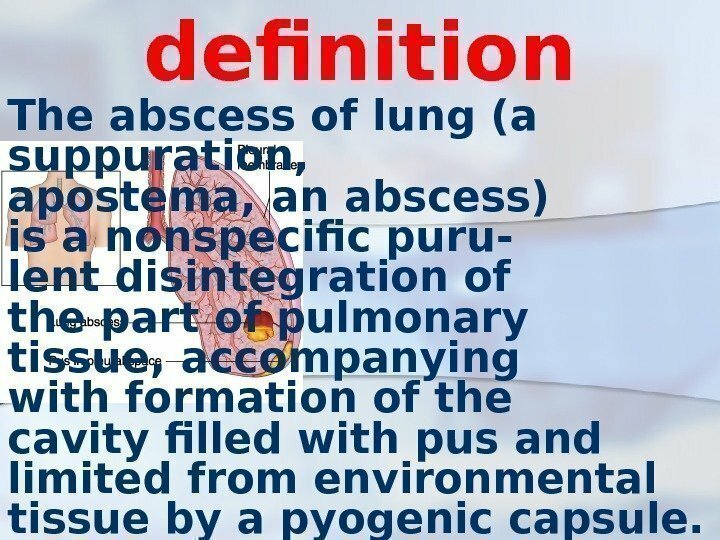 definition The abscess of lung (a suppuration, apostema, an abscess) is a nonspecific puru- lent disintegration of the part of pulmonary tissue, accompanying with formation of the cavity filled with pus and limited from environmental tissue by a pyogenic capsule. 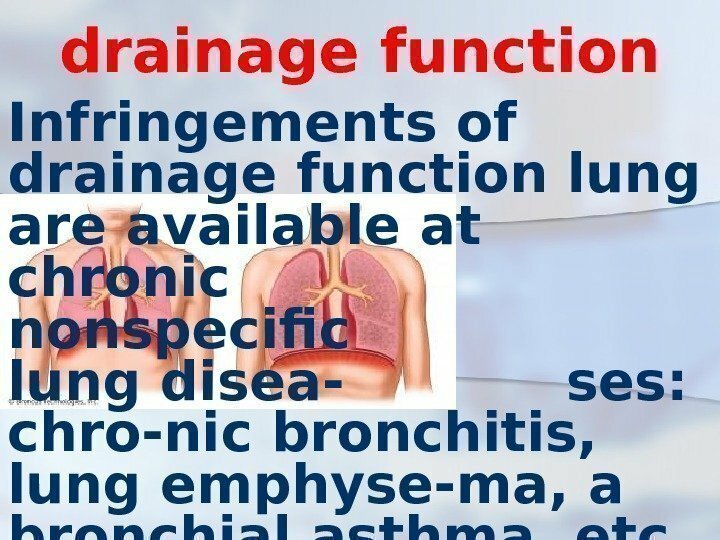 drainage function Infringements of drainage function lung are available at chronic nonspecific lung disea- ses: chro-nic bronchitis, lung emphyse-ma, a bronchial asthma, etc. 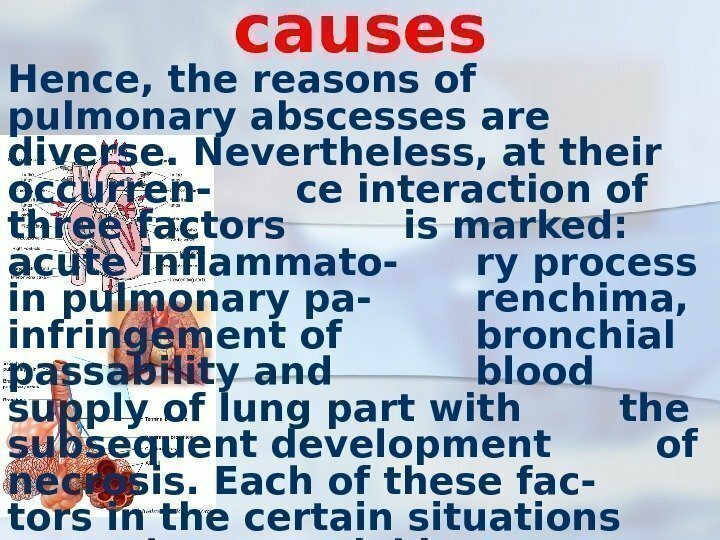 causes Hence, the reasons of pulmonary abscesses are diverse. 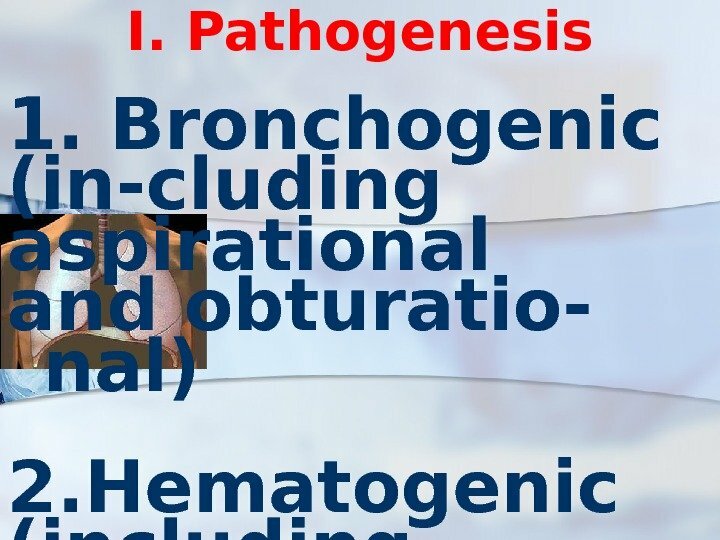 Nevertheless, at their occurren- ce interaction of three factors is marked: acute inflammato- ry process in pulmonary pa- renchima, infringement of bronchial passability and blood supply of lung part with the subsequent development of necrosis. Each of these fac- tors in the certain situations may have crucial importance. 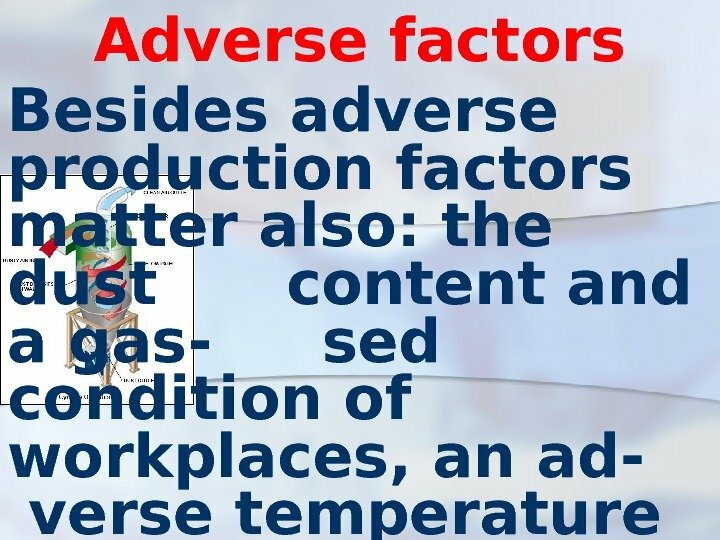 Adverse factors Besides adverse production factors matter also: the dust content and a gas- sed condition of workplaces, an ad- verse temperature mode etc. 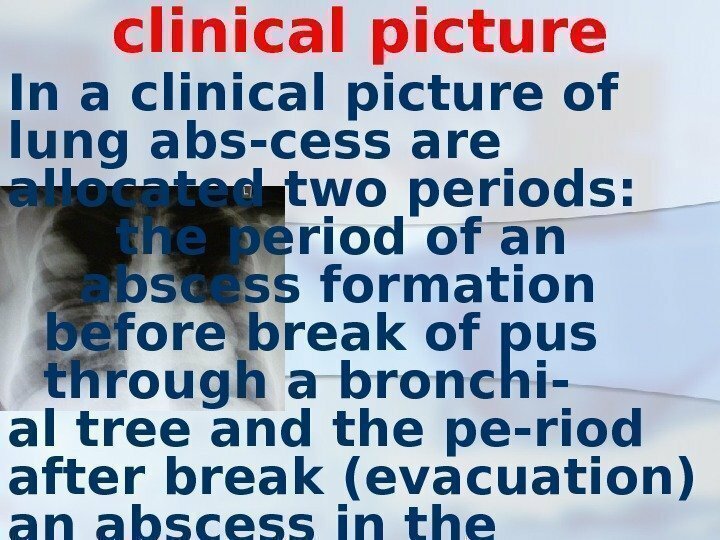 clinical picture In a clinical picture of lung abs-cess are allocated two periods: the period of an abscess formation before break of pus through a bronchi- al tree and the pe-riod after break (evacuation) an abscess in the draining bronchial tube. 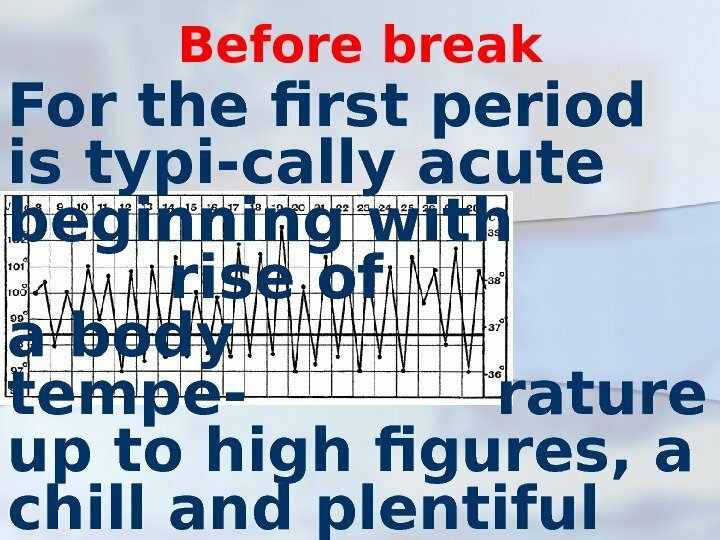 Before break For the first period is typi-cally acute beginning with rise of a body tempe- rature up to high figures, a chill and plentiful sweat then. 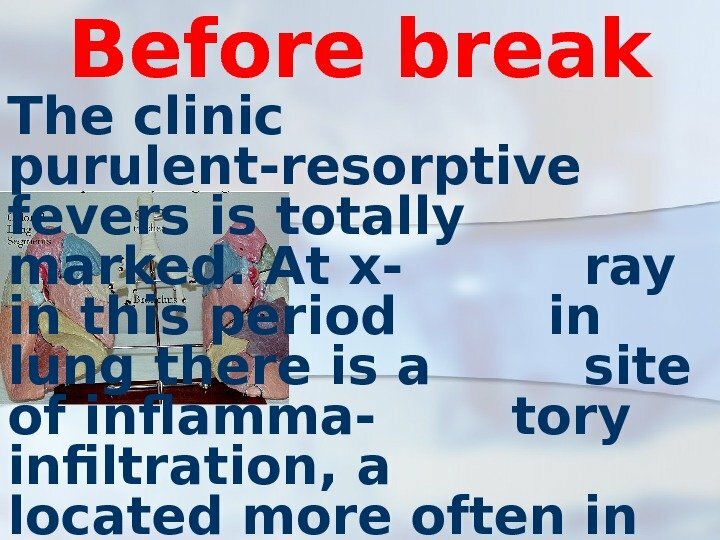 Before break The clinic purulent-resorptive fevers is totally marked. 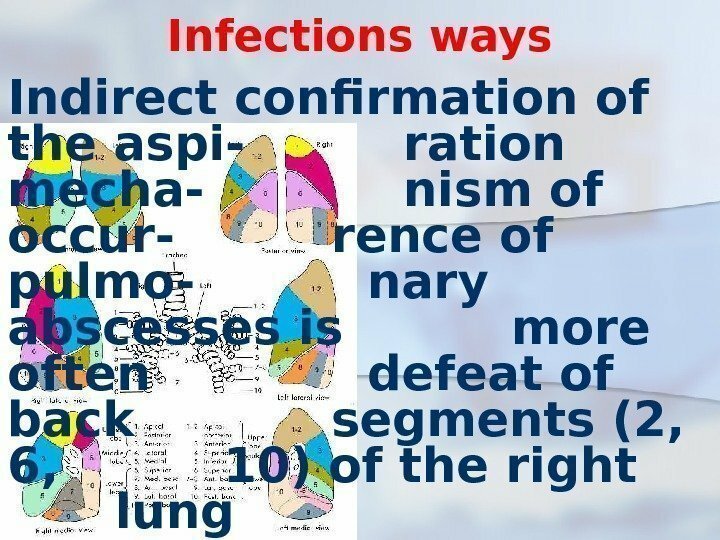 At x- ray in this period in lung there is a site of inflamma- tory infiltration, a located more often in 2, 6 or 10 segment right lung. 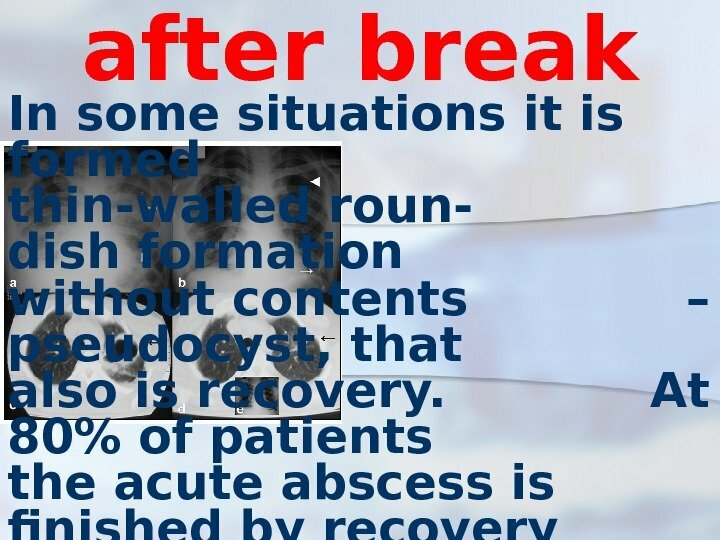 after break In the second period when an abs-cess evacuates through a bronchial tree, the clinical pictu- re becomes typical. 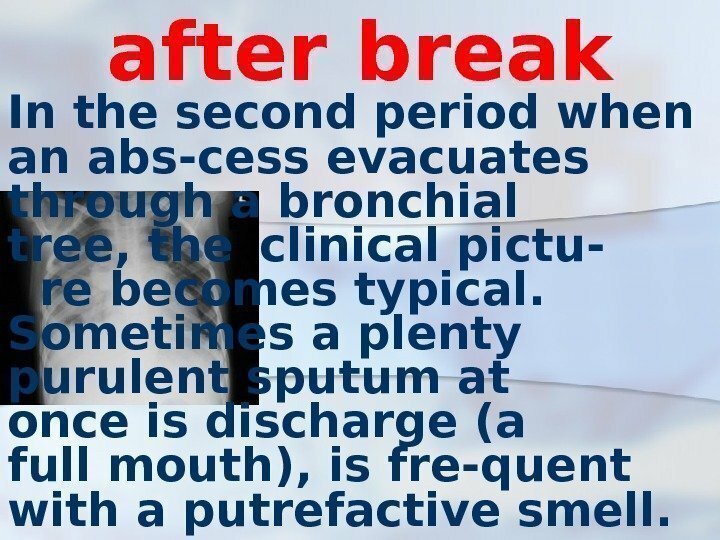 Sometimes a plenty purulent sputum at once is discharge (a full mouth), is fre-quent with a putrefactive smell. 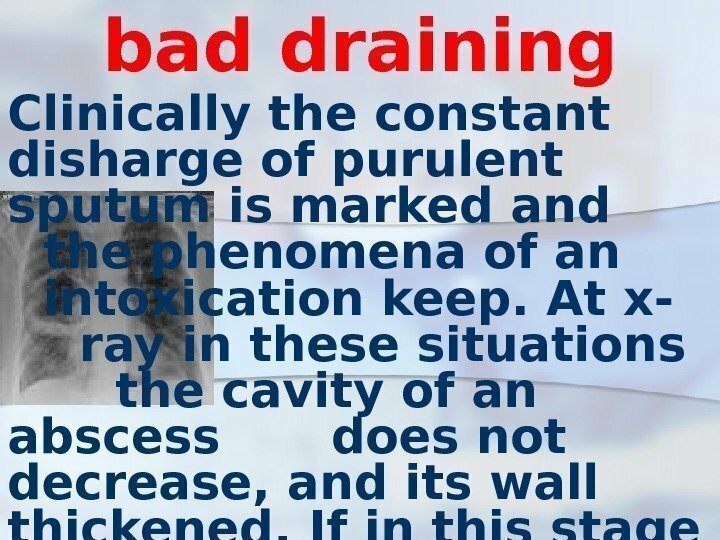 bad draining Clinically the constant disharge of purulent sputum is marked and the phenomena of an intoxication keep. 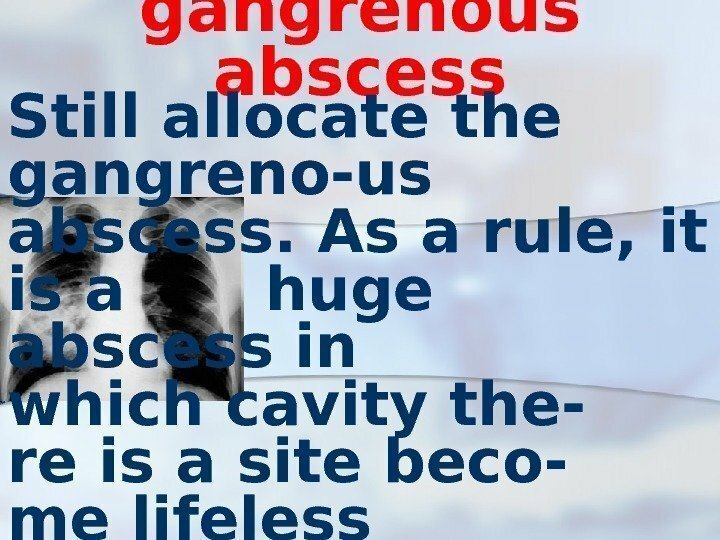 At x- ray in these situations the cavity of an abscess does not decrease, and its wall thickened. 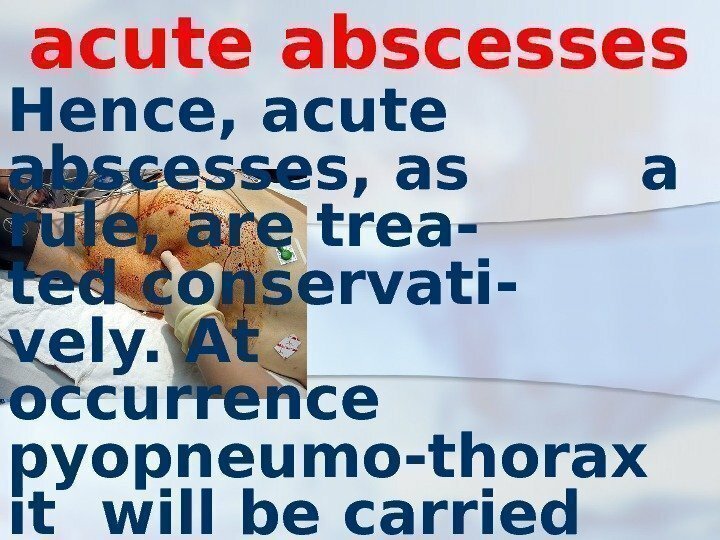 If in this stage it is not possible to unblock an abscess it becomes chronic. 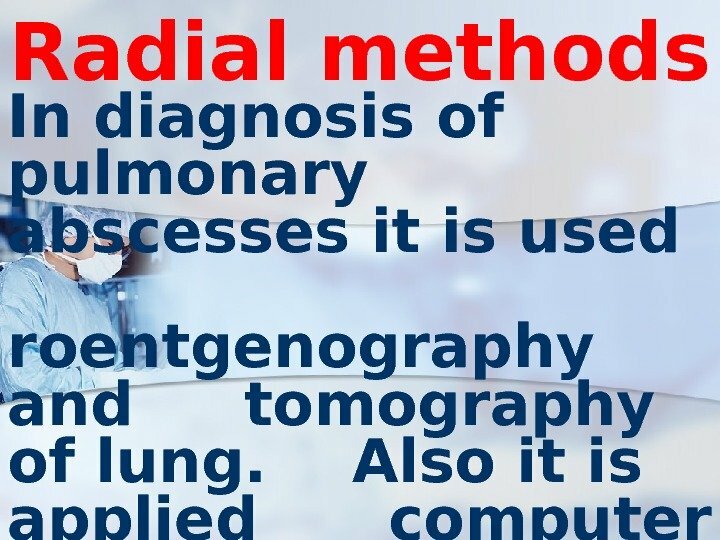 Radial methods In diagnosis of pulmonary abscesses it is used roentgenography and tomography of lung. Also it is applied computer tomogra-phy and ultrasonic investigation. 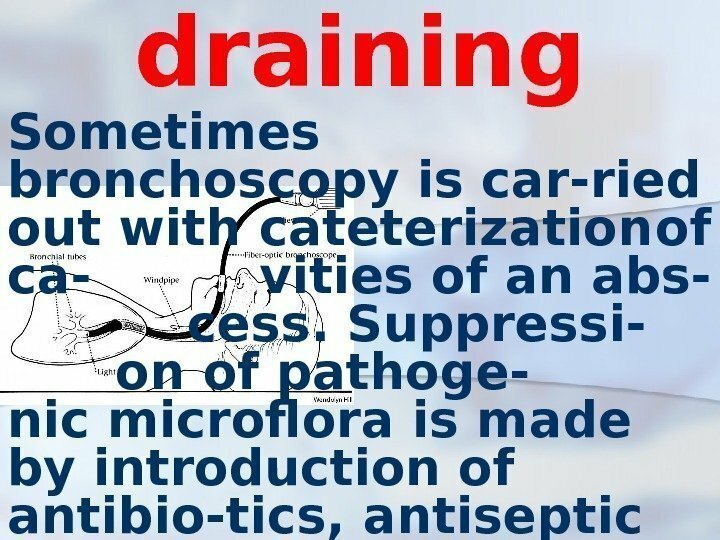 draining Sometimes bronchoscopy is car-ried out with cateterization of ca- vities of an abs- cess. 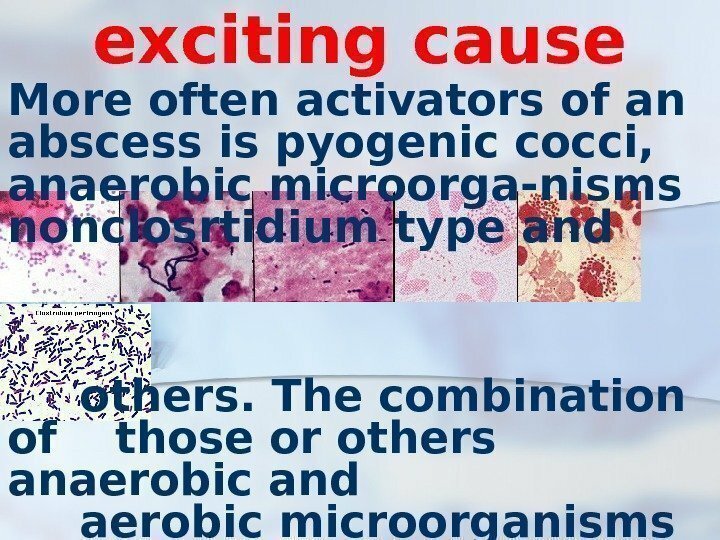 Suppressi- on of pathoge- nic microflora is made by introduction of antibio-tics, antiseptic tanks and sulfa-preparations. 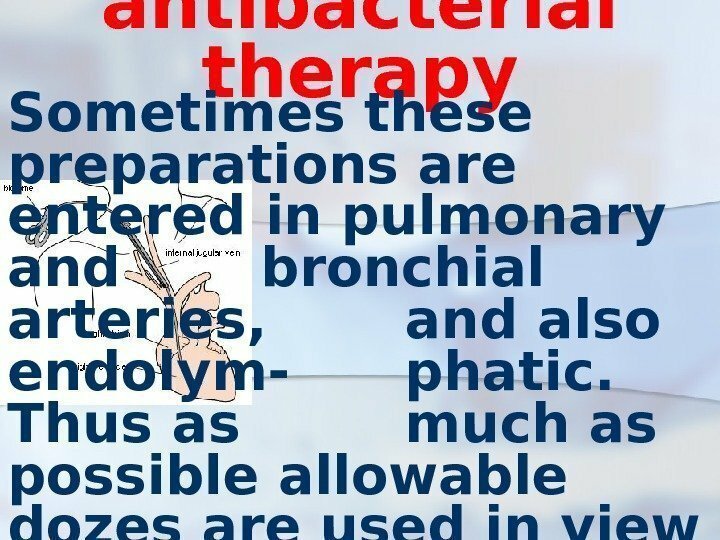 antibacterial therapy Sometimes these preparations are entered in pulmonary and bronchial arteries, and also endolym- phatic. 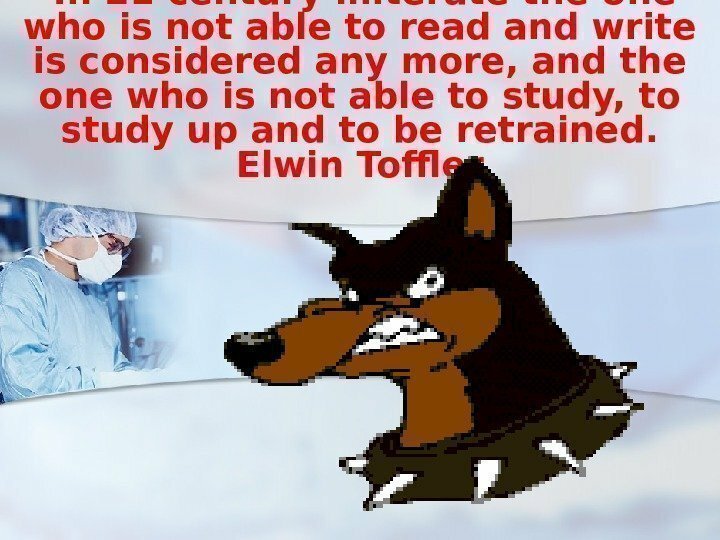 Thus as much as possible allowable dozes are used in view of sensitivity of micro-flora. 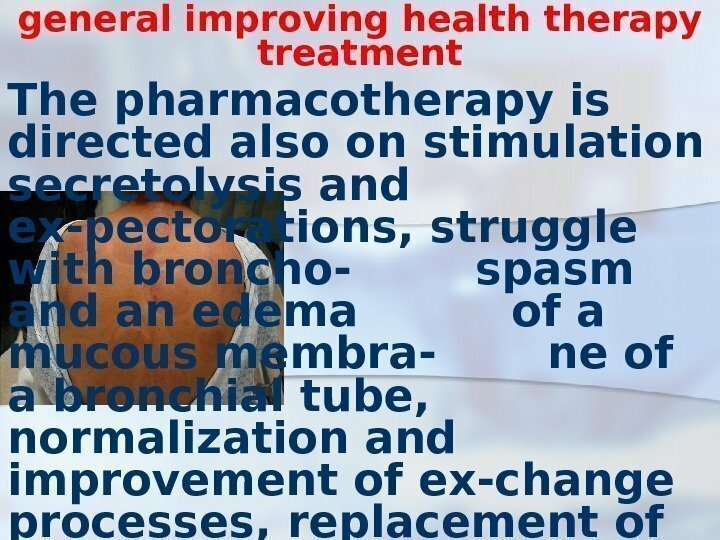 general improving health therapy treatment The pharmacotherapy is directed also on stimulation secretolysis and ex-pectorations, struggle with broncho- spasm and an edema of a mucous membra- ne of a bronchial tube, normalization and improvement of ex-change processes, replacement of immunologic defects etc. 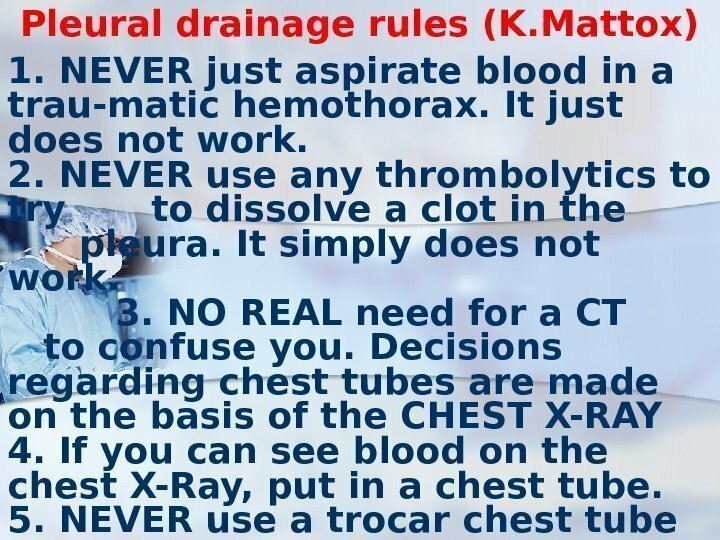 Pleural drainage rules (K. Mattox) 6. In teenage patients and adults for trau-matic hemothorax use a 36 French Chest tube with multiple holes in the end, with the last hole interrupting the barium sen-tinel stripe. 7. ALWAYS put in a suture in the skin widely around the chest tube, to be used for an air tight closure when the chest tube is pulled. A LARGE Horizontal Mattress suture. Put in ONE throw of a knot, but do not tie it. Roman saddle it around the tube for many circles and then tie a BIG BOW which can be untied later. 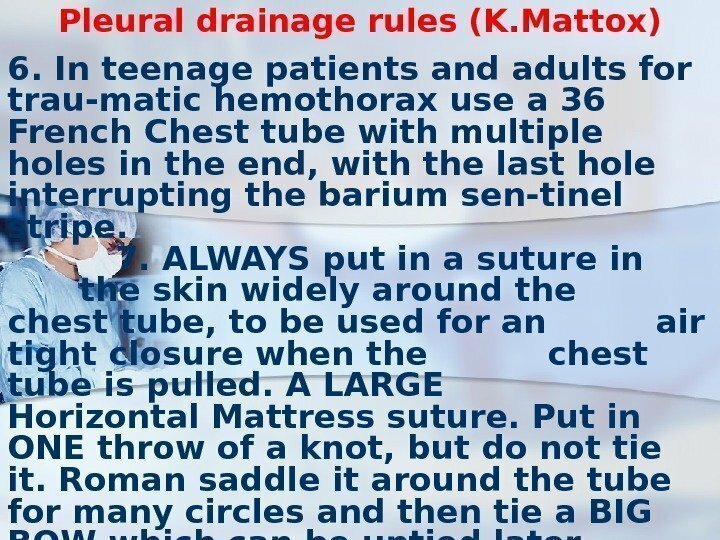 Pleural drainage rules (K. Mattox) 8. ALWAYS connect to suction at about 20 CM negative pressure. ALWAYS 9. 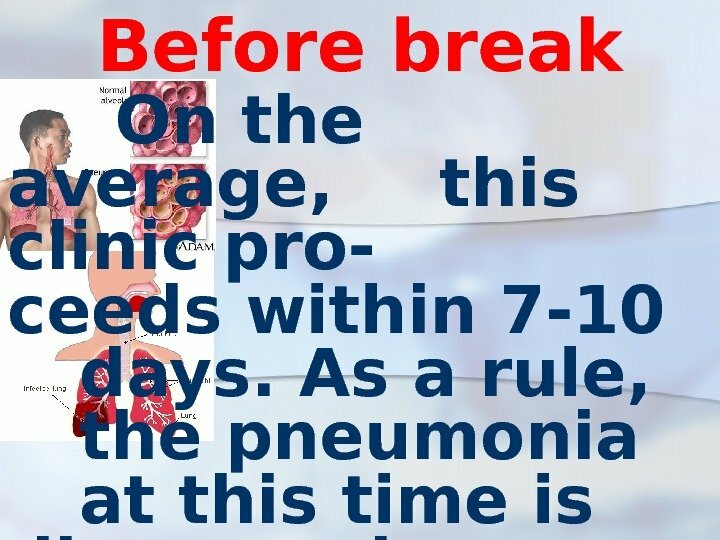 ALWAYS use rubber secondary tubes to the bottles, so that the tubes can be MILKED to remove early clot 10. ALWAYS get a post insertion chest X-ray. 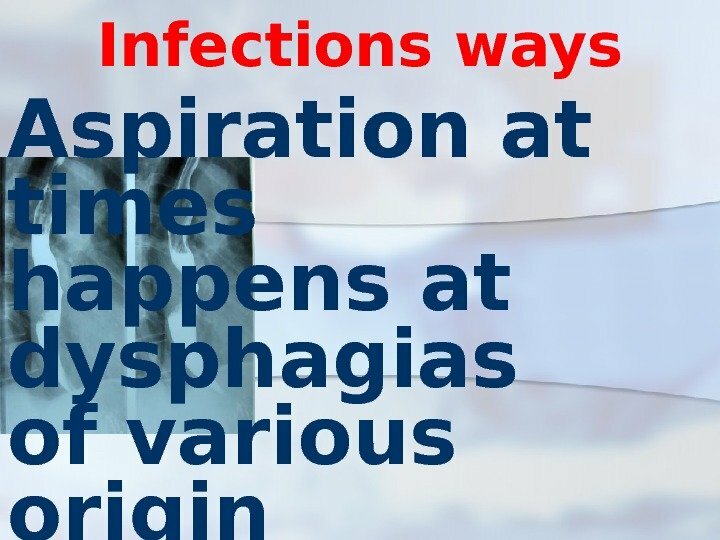 There will be a malposition many more times than you can ever imaging. 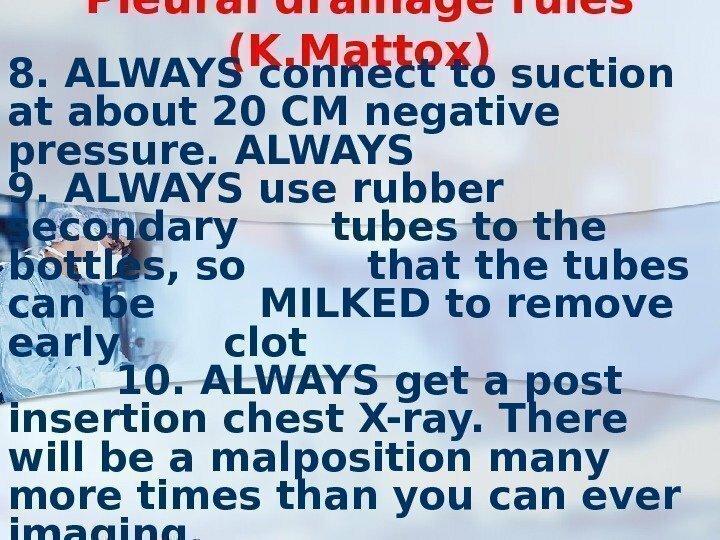 Pleural drainage rules (K. Mattox) 11. ALWAYS have the best person available to insert the tube who is in the hospital at the time either insert it, or personally and physically supervise the lesser person. 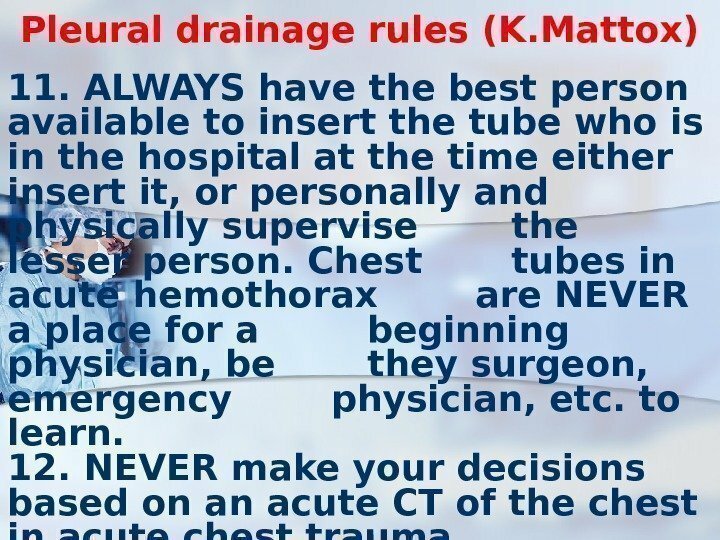 Chest tubes in acute hemothorax are NEVER a place for a beginning physician, be they surgeon, emergency physician, etc. to learn. 12. 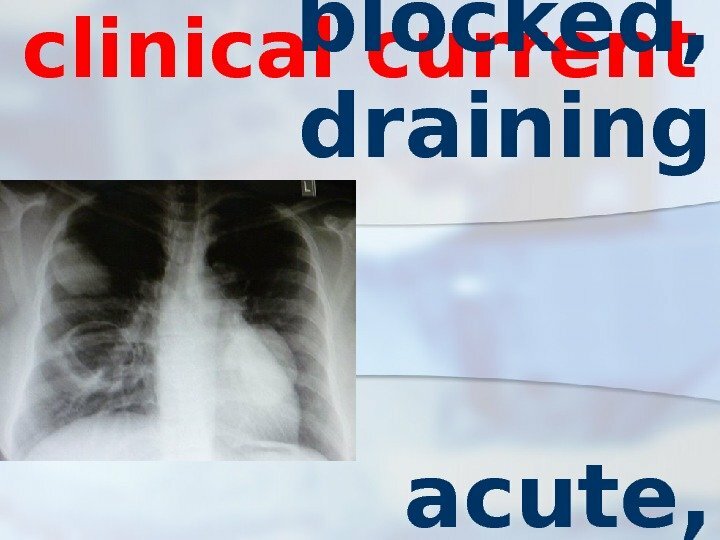 NEVER make your decisions based on an acute CT of the chest in acute chest trauma. 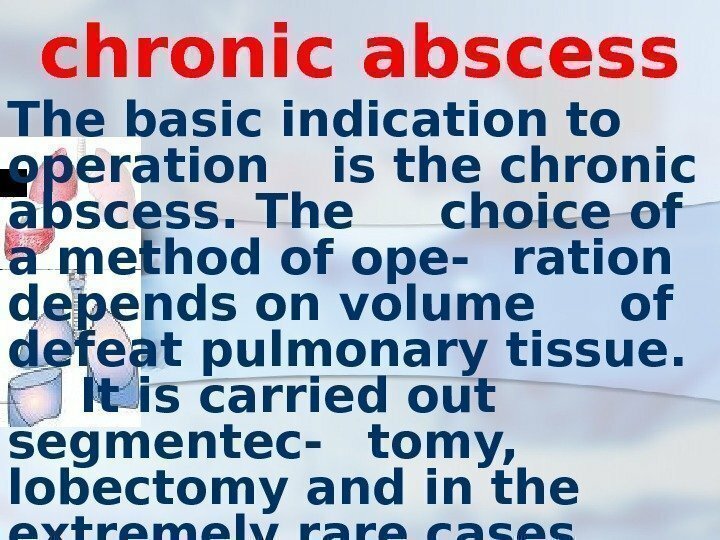 chronic abscess The basic indication to operation is the chronic abscess. 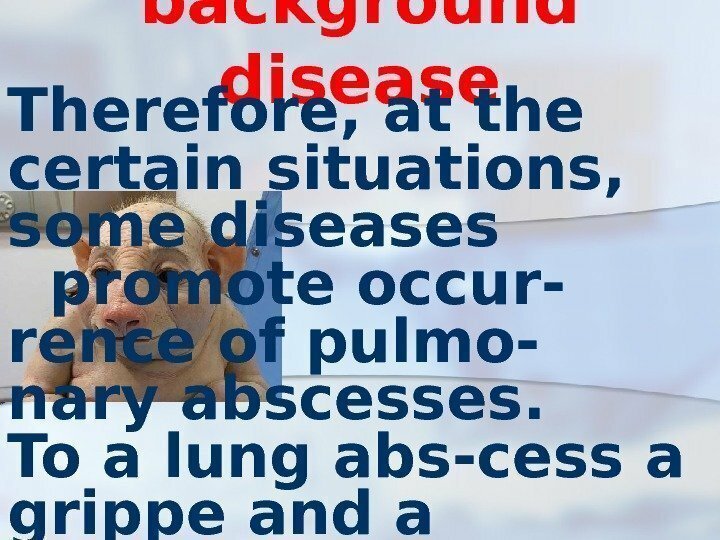 The choice of a method of ope- ration depends on volume of defeat pulmonary tissue. 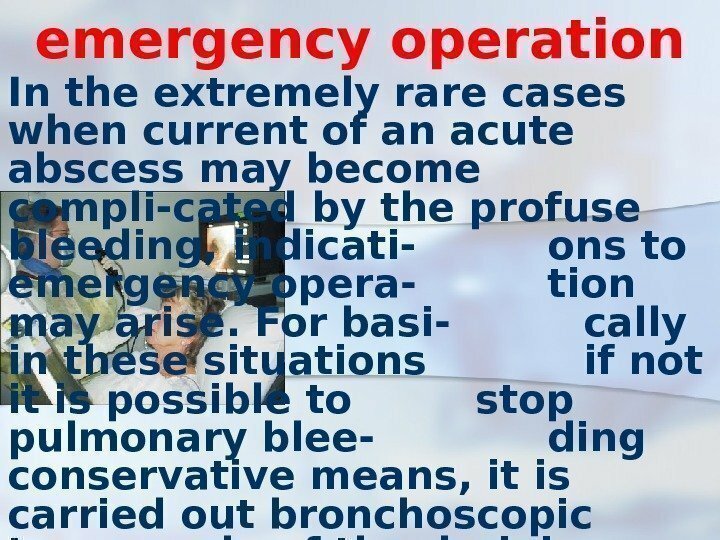 It is carried out segmentec- tomy, lobectomy and in the extremely rare cases bylob-ectomy. 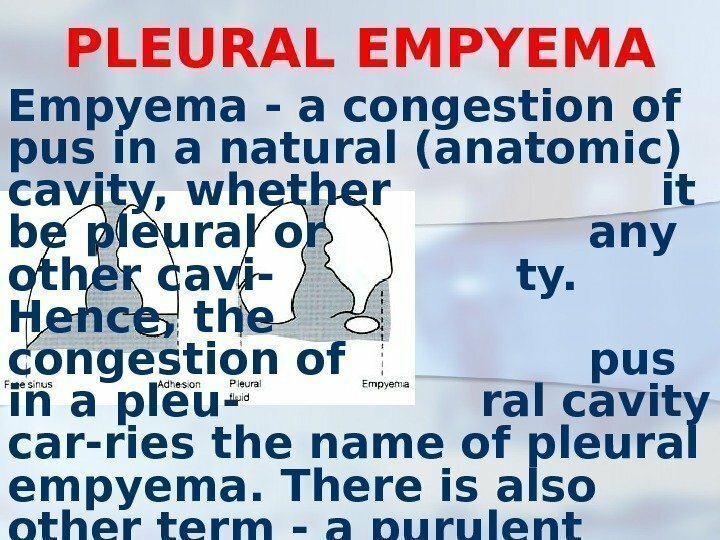 PLEURAL EMPYEMA Empyema — a congestion of pus in a natural (anatomic) cavity, whether it be pleural or any other cavi- ty. 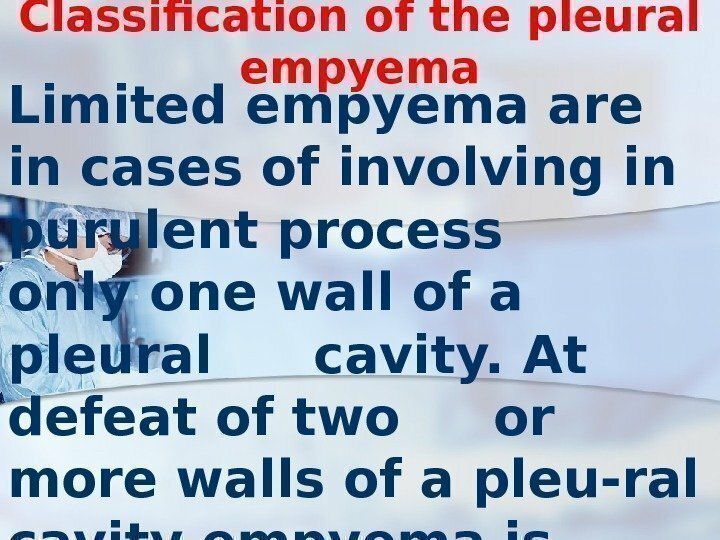 Hence, the congestion of pus in a pleu- ral cavity car-ries the name of pleural empyema. 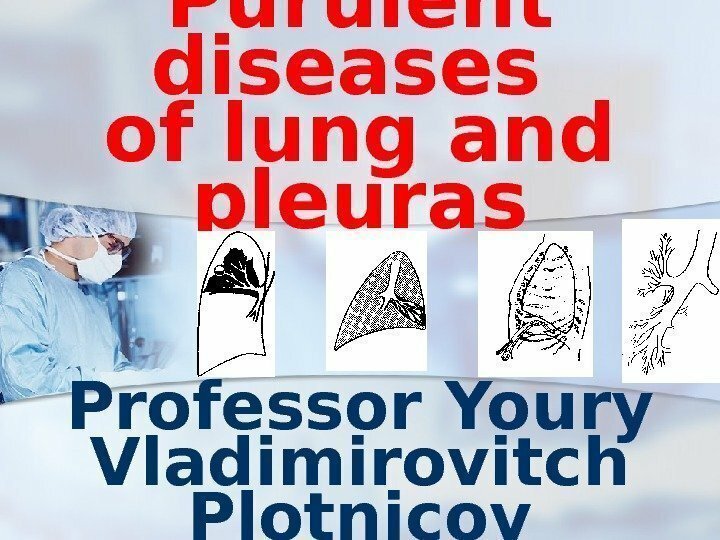 There is also other term — a purulent pleurisy. 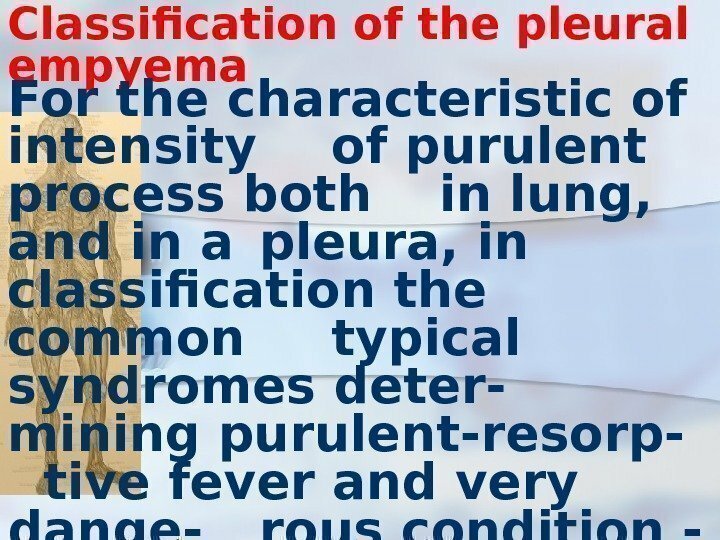 Pleural empyema The purulent pleurisy is the inflam-mation of pleural lists accompanying exudating in a pleural cavity of the purulent exudate. 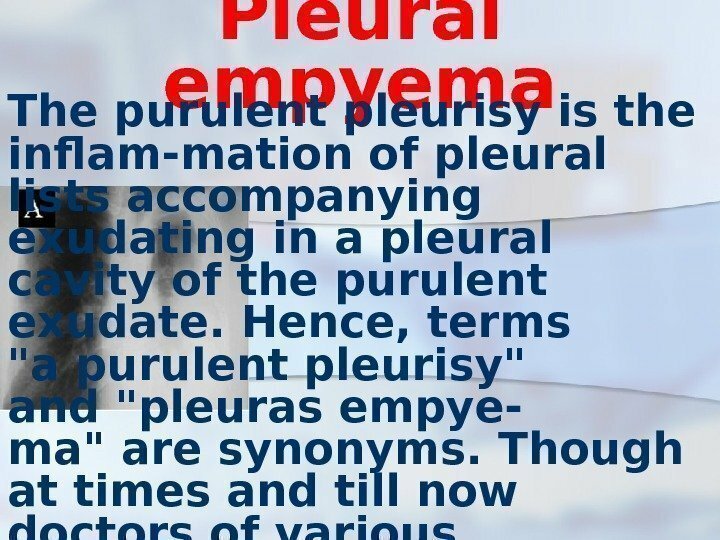 Hence, terms «a purulent pleurisy» and «pleuras empye- ma» are synonyms. 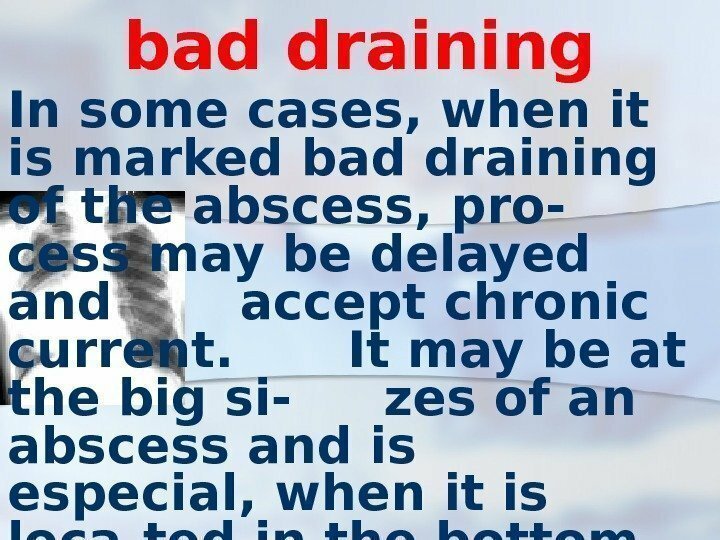 Though at times and till now doctors of various specialities confuse these conditions. 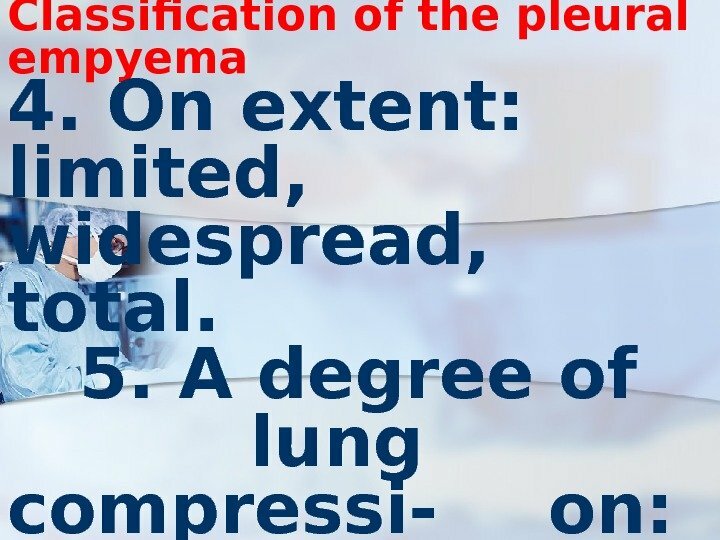 Pleural empyema in 90% of cases is complication of purulent lung disea- ses. 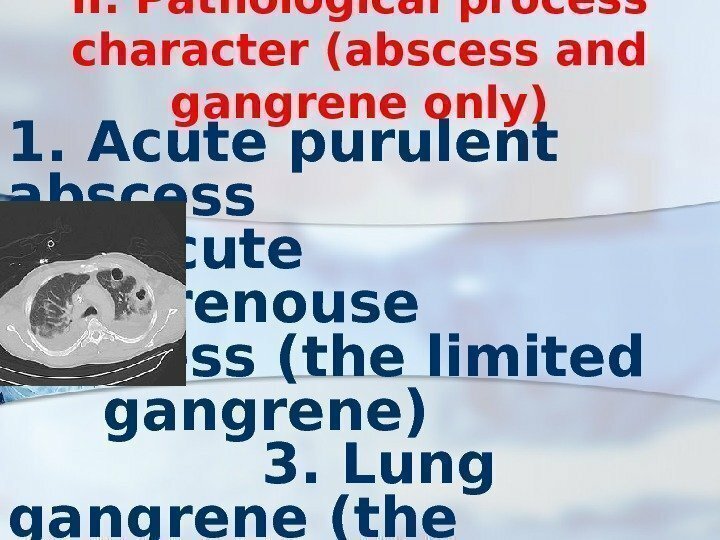 First of all it arises at an lung abscess and gangrene, acute pneumo- nias and sometimes at bronchoectasy. 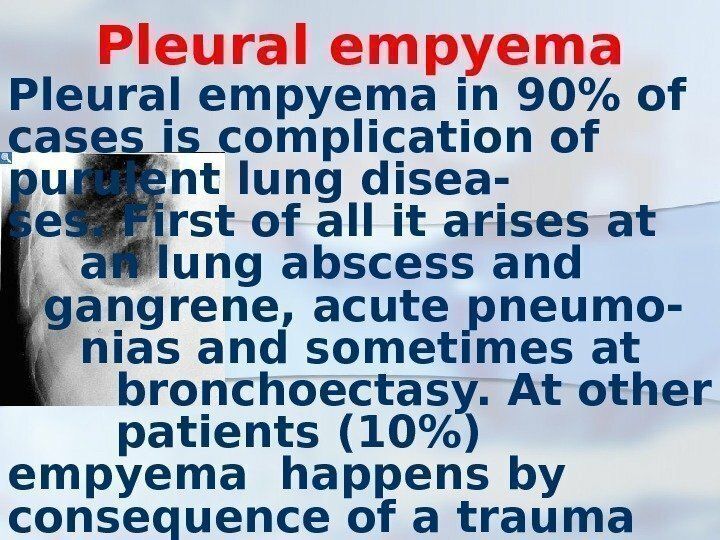 At other patients (10%) empyema happens by consequence of a trauma and outlung processes. 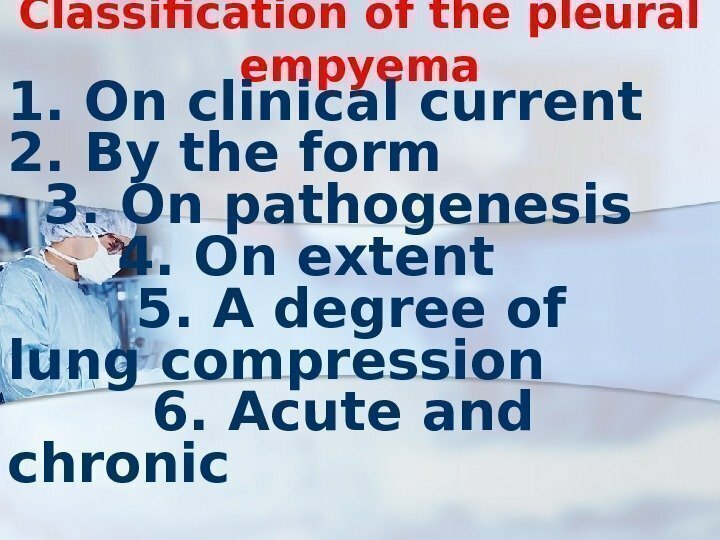 Classification of the pleural empyema 1. On clinical current: the purulent-resorptive fever and exhaustion. 2. 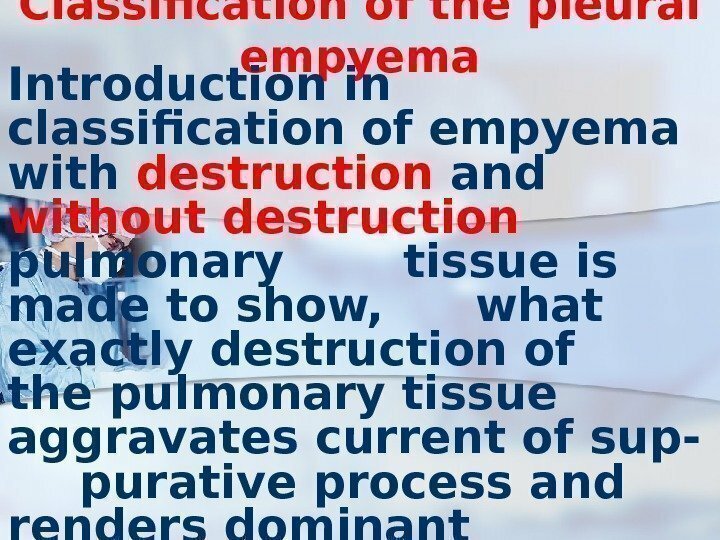 By the form: empyema without destruction of the pulmonary tissue or with destruction of the pulmo-nary tissue. 3. 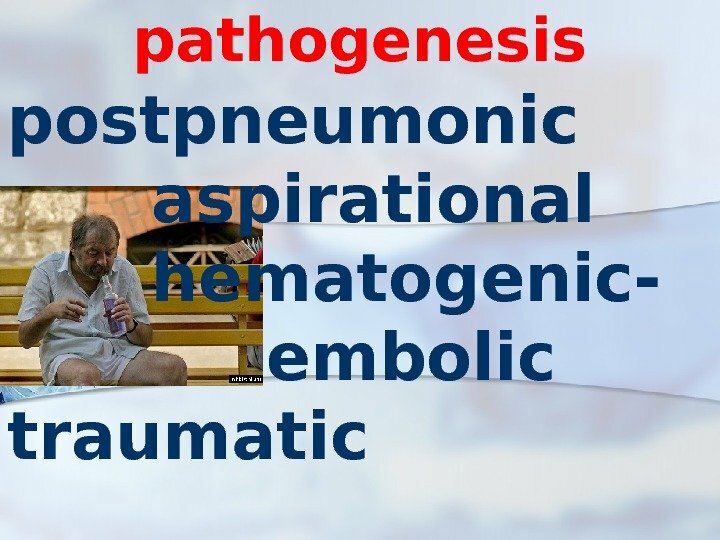 On pathogenesis: meta- and parapneumonic, posttraumatic, metastatic and sympathetic. 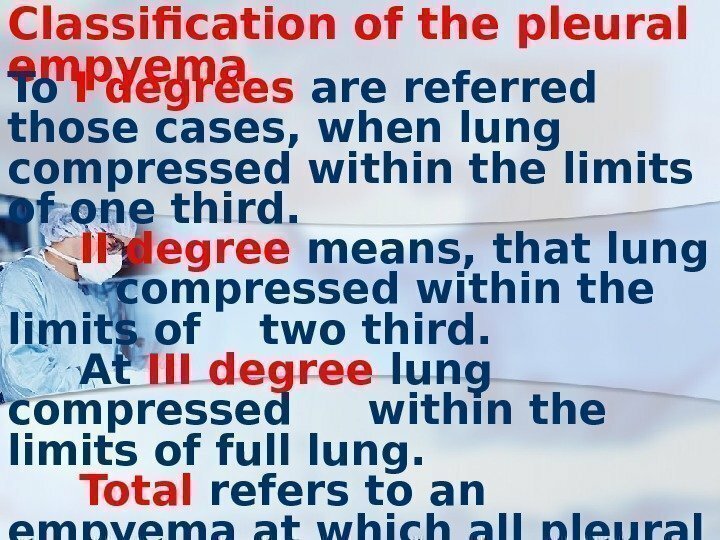 Classification of the pleural empyema To I degrees are referred those cases, when lung compressed within the limits of one third. II degree means, that lung compressed within the limits of two third. 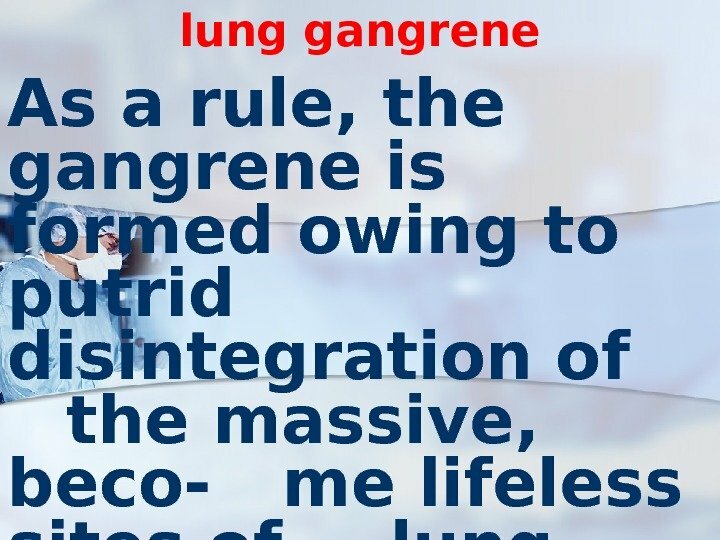 At III degree lung compressed within the limits of full lung. Total refers to an empyema at which all pleural cavity from diaphragm up to a dome is amazed. 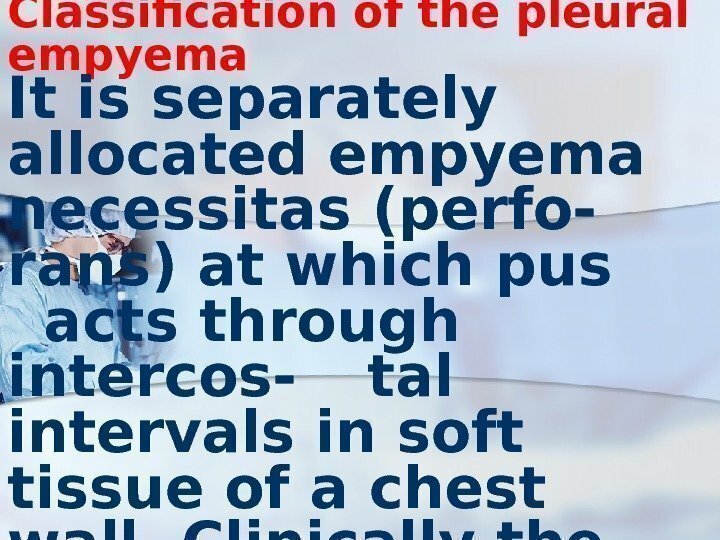 Classification of the pleural empyema It is separately allocated empyema necessitas (perfo- rans) at which pus acts through intercos- tal intervals in soft tissue of a chest wall. 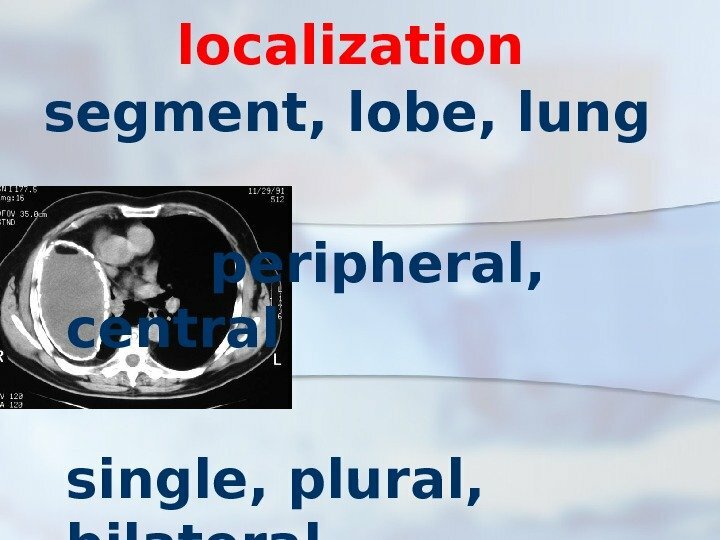 Clinically the phlegmon of a chest wall is defined. 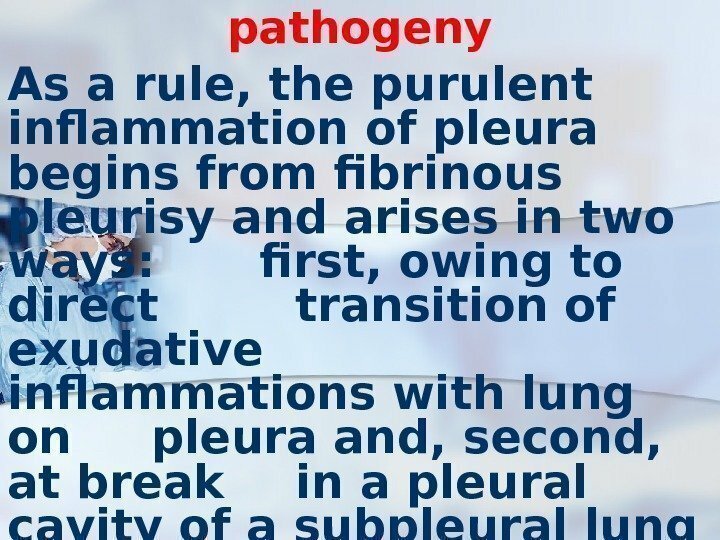 pathogeny As a rule, the purulent inflammation of pleura begins from fibrinous pleurisy and arises in two ways: first, owing to direct transition of exudative inflammations with lung on pleura and, second, at break in a pleural cavity of a subpleural lung abscess. 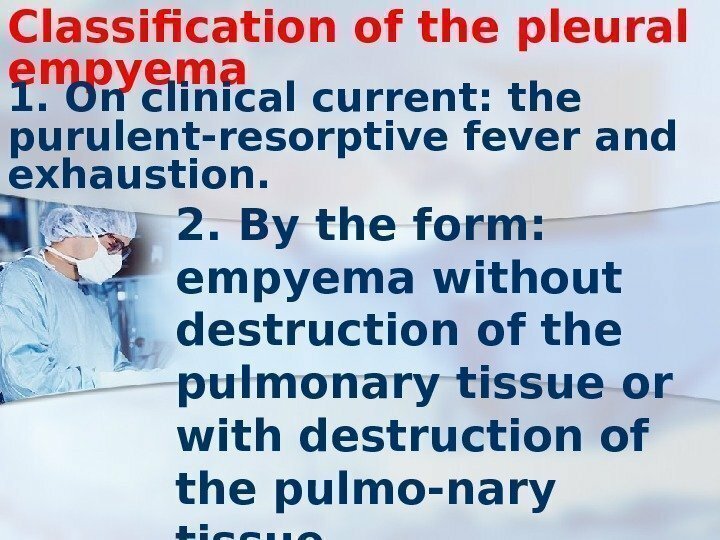 The second way of development pleural empyema more often takes place. 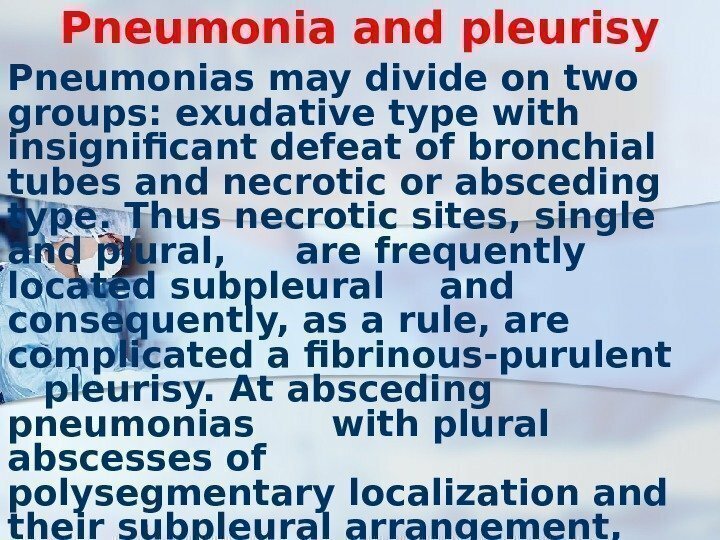 Pneumonia and pleurisy Pneumonias may divide on two groups: exudative type with insignificant defeat of bronchial tubes and necrotic or absceding type. Thus necrotic sites, single and plural, are frequently located subpleural and consequently, as a rule, are complicated a fibrinous-purulent pleurisy. 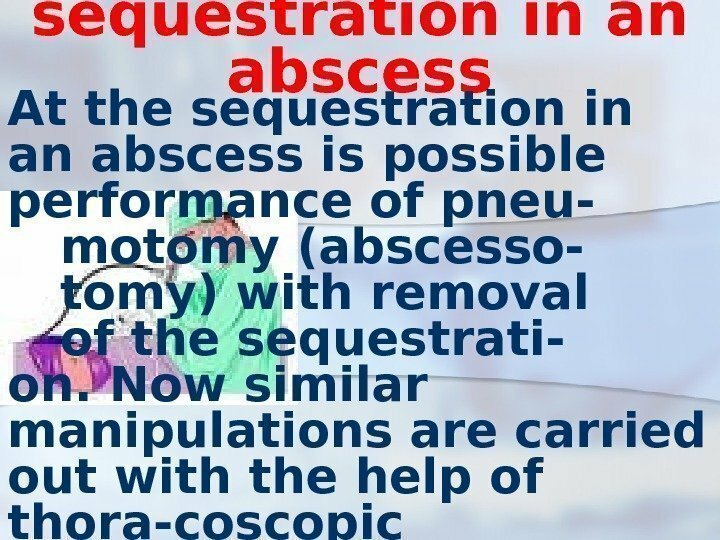 At absceding pneumonias with plural abscesses of polysegmentary localization and their subpleural arrangement, break of an abscess in a pleura cavity is possible with development of empyema. clinic Clinical picture. At pleural empyema occur pains in a thorax on the side of defeat, the dyspnea is amplifies. 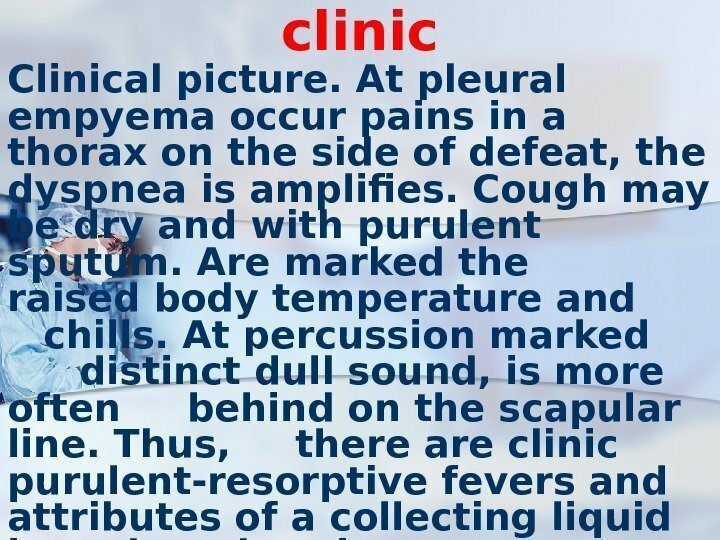 Cough may be dry and with purulent sputum. Are marked the raised body temperature and chills. At percussion marked distinct dull sound, is more often behind on the scapular line. 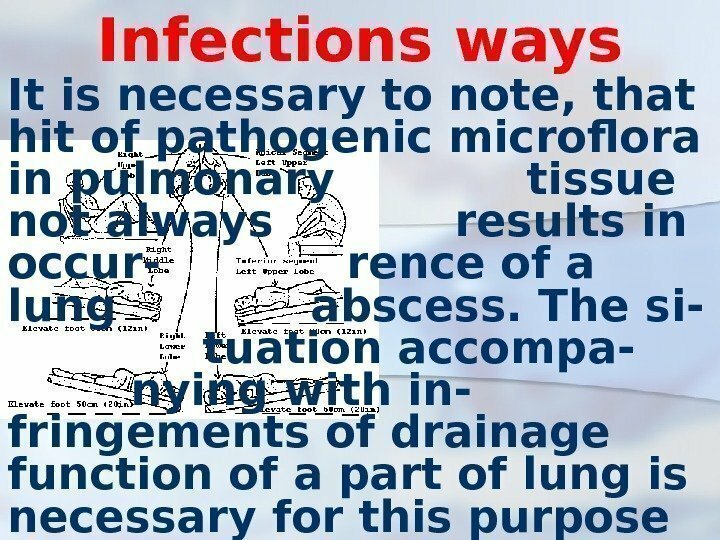 Thus, there are clinic purulent-resorptive fevers and attributes of a collecting liquid in a pleural cavity. 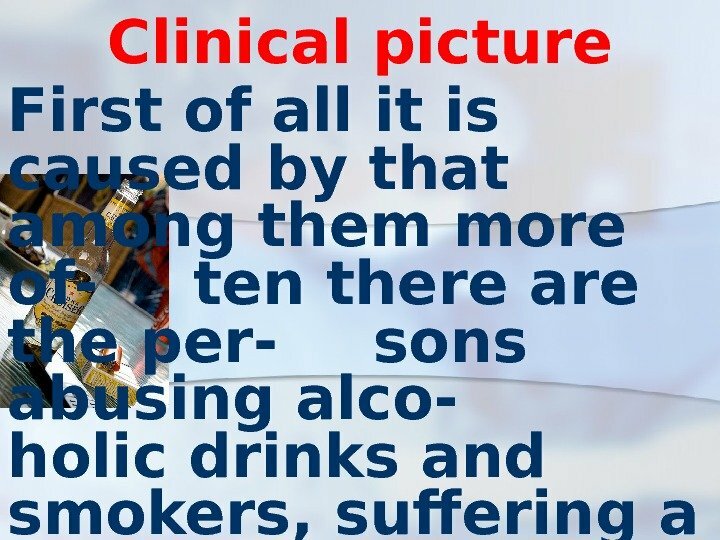 Nevertheless, the clinical picture is various. It depends on many reasons. 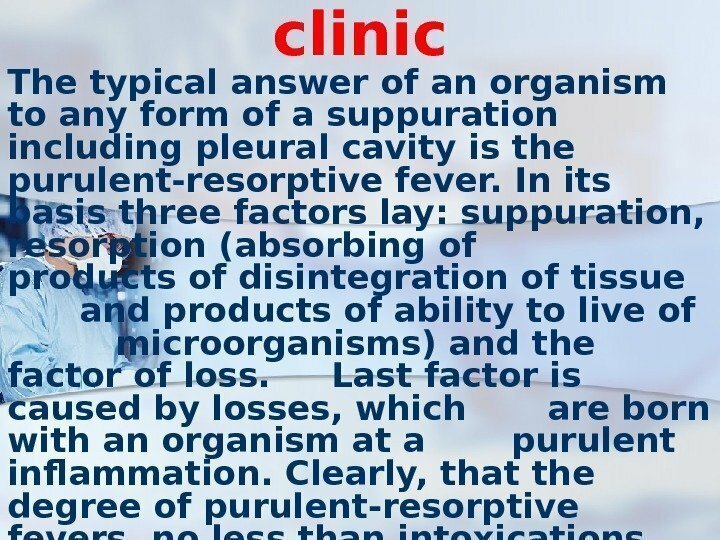 clinic The typical answer of an organism to any form of a suppuration including pleural cavity is the purulent-resorptive fever. 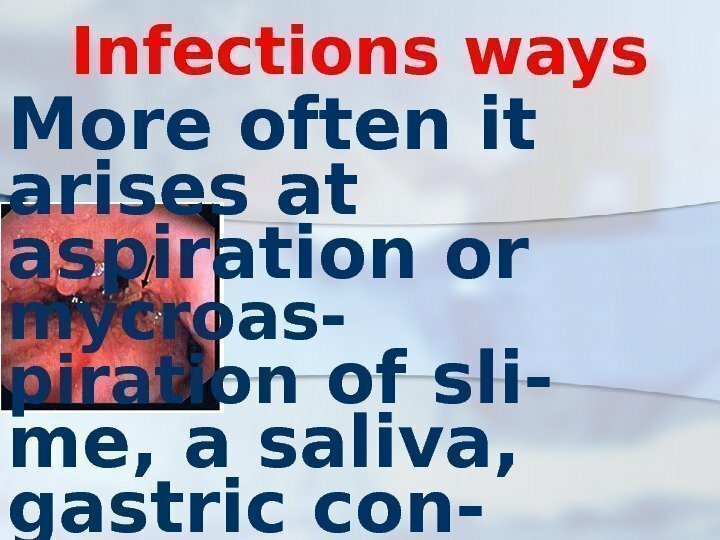 In its basis three factors lay: suppuration, resorption (absorbing of products of disintegration of tissue and products of ability to live of microorganisms) and the factor of loss. Last factor is caused by losses, which are born with an organism at a purulent inflammation. Clearly, that the degree of purulent-resorptive fevers, no less than intoxications, may be various — beginning from easy and finishing the hardest. 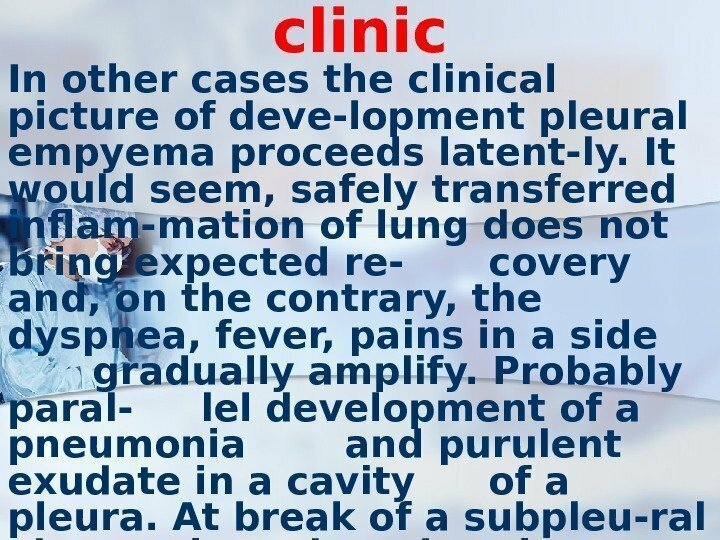 clinic In other cases the clinical picture of deve-lopment pleural empyema proceeds latent-ly. 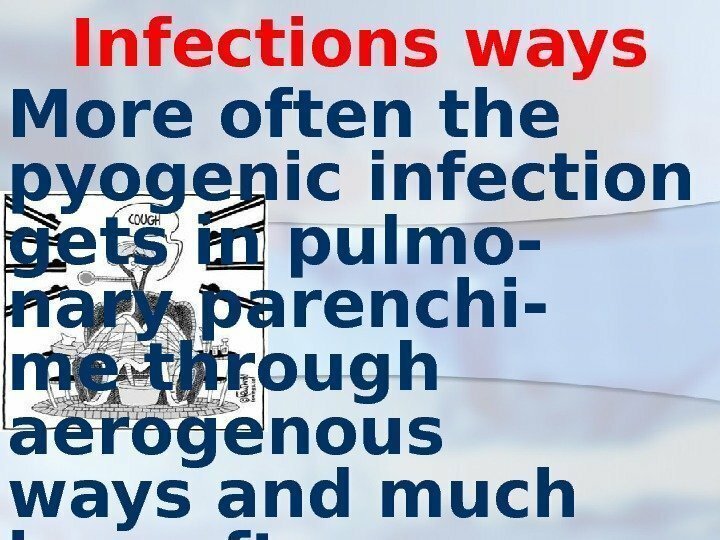 It would seem, safely transferred inflam-mation of lung does not bring expected re- covery and, on the contrary, the dyspnea, fever, pains in a side gradually amplify. Probably paral- lel development of a pneumonia and purulent exudate in a cavity of a pleura. 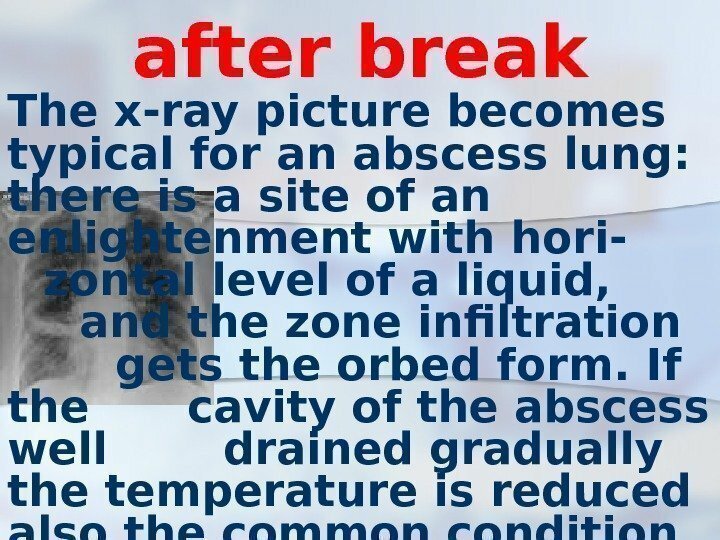 At break of a subpleu-ral abscess in a pleural cavity distinguish three clinical forms: acute, soft and erased. 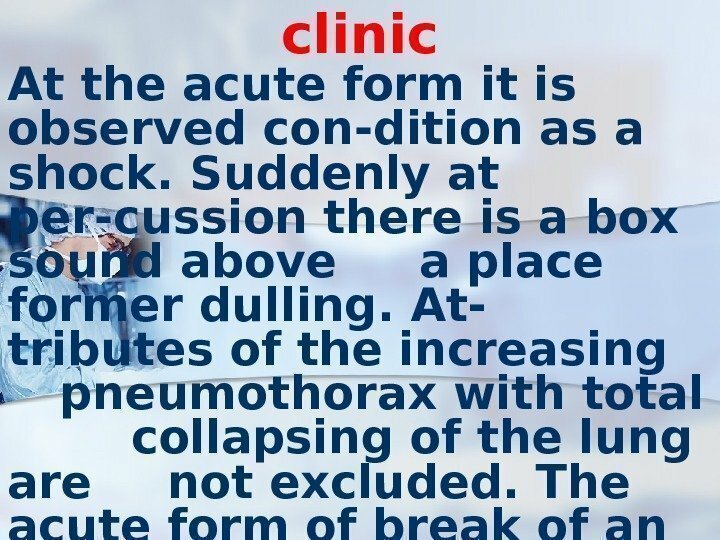 clinic At the acute form it is observed con-dition as a shock. Suddenly at per-cussion there is a box sound above a place former dulling. 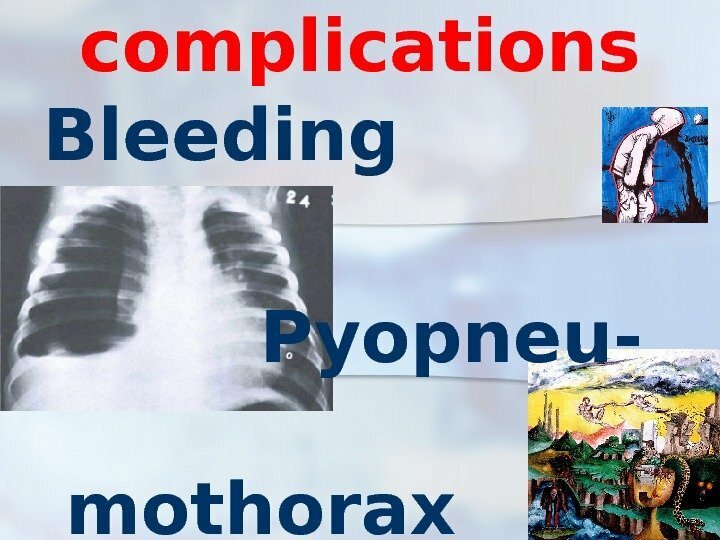 At- tributes of the increasing pneumothorax with total collapsing of the lung are not excluded. 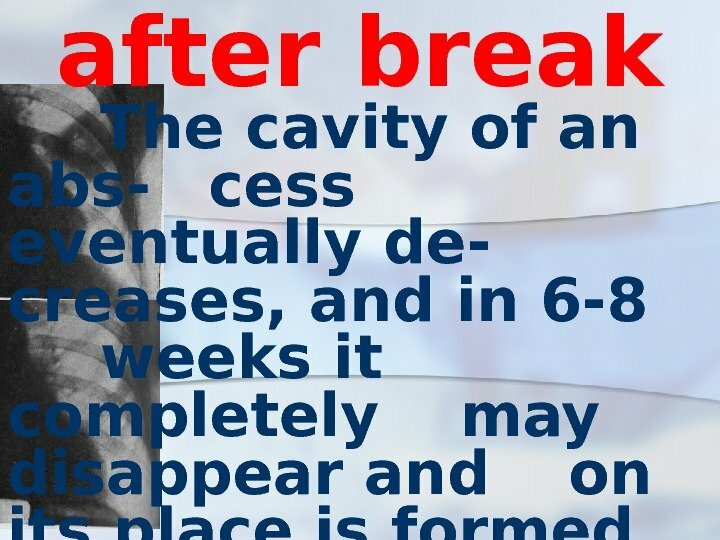 The acute form of break of an abscess in a free pleural cavity meets seldom. 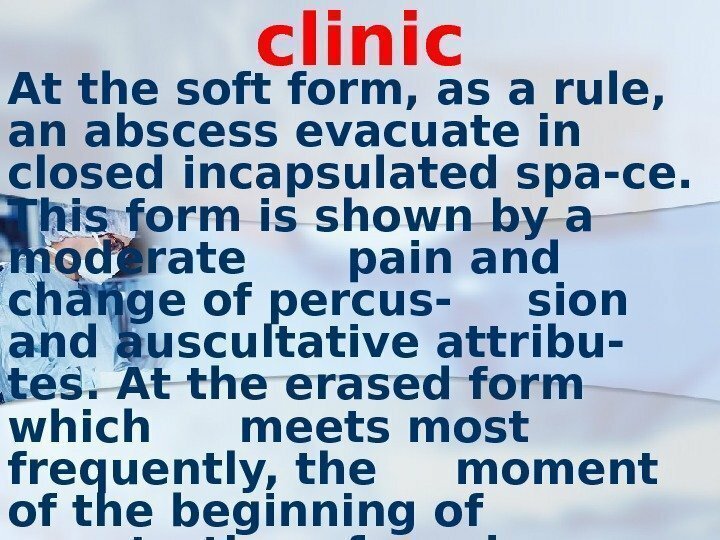 clinic At the soft form, as a rule, an abscess evacuate in closed incapsulated spa-ce. This form is shown by a moderate pain and change of percus- sion and auscultative attribu- tes. At the erased form which meets most frequently, the moment of the beginning of penetration of pus in a pleura is diffi-cultly perceptible. 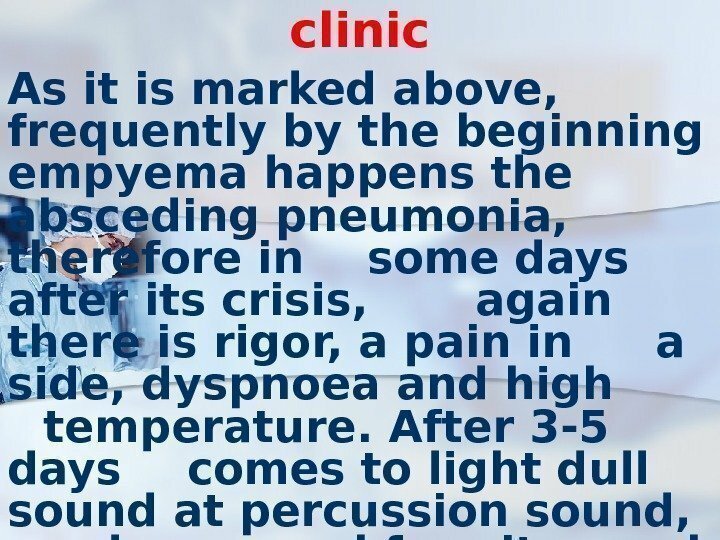 clinic The raised body temperature is one of the major attributes of empyema of pleura. Temperature reactions may proceed on remitting type, as wrong waves with the tendency to morning downturn. However, the temperature, as a rule, is not reduced up to normal or even subnormal figures. 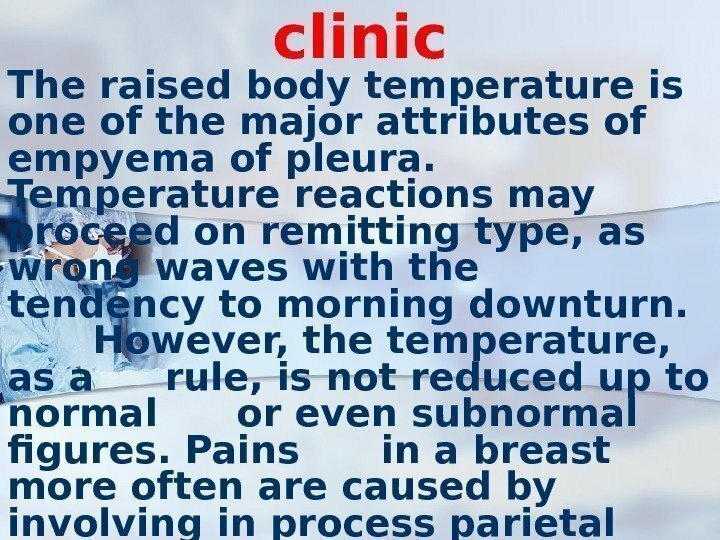 Pains in a breast more often are caused by involving in process parietal pleuras. 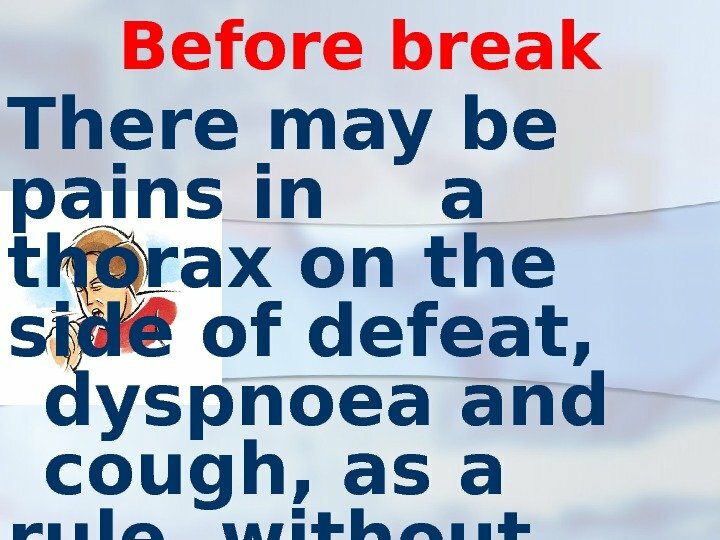 In the same time a pain may be caused by destruction of lung tissues. 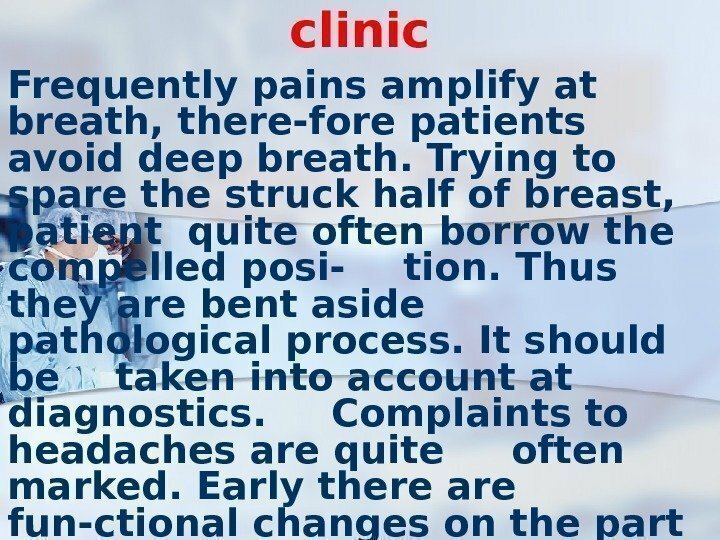 clinic Frequently pains amplify at breath, there-fore patients avoid deep breath. Trying to spare the struck half of breast, patient quite often borrow the compelled posi- tion. Thus they are bent aside pathological process. 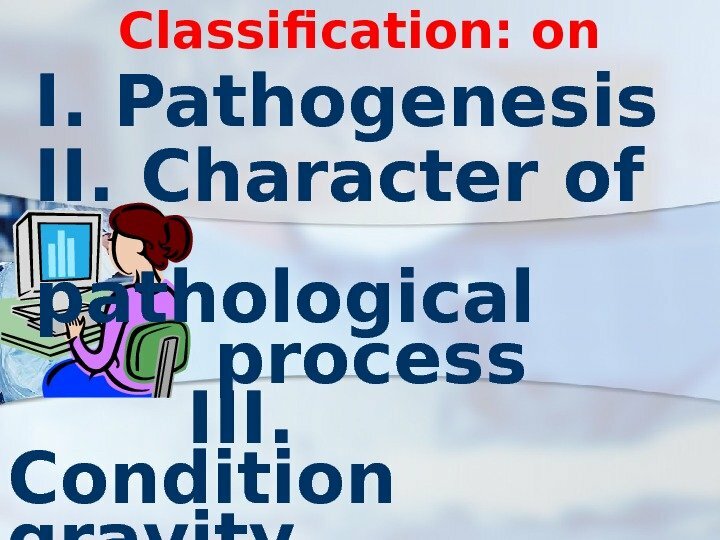 It should be taken into account at diagnostics. Complaints to headaches are quite often marked. Early there are fun-ctional changes on the part of cardiovascu-lar system, a liver and kidneys. Infringe-ments of clotting systems of blood are possible. 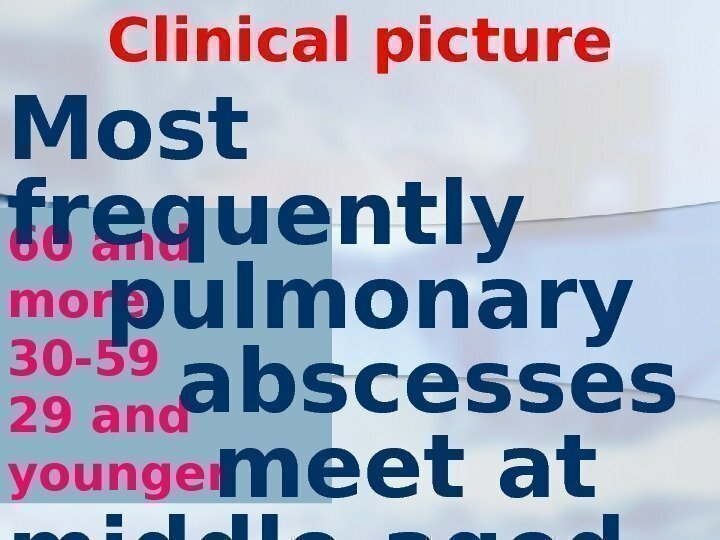 clinic Restriction of respiratory excursions of a chest is marked on the side of defeat. At widespread and total pleural empyema smoothing intercostal intervals is quite often observed. Thus scapula on the side of defeat rises up slightly and lags behind at breath in comparison with another scapula. At palpation sometimes is marked resistence of soft tissues of chest wall. A characteristic attribute of a con- gestion of a liquid in a pleural cavity is easing vocal fremitus and dullness of percussion sound. 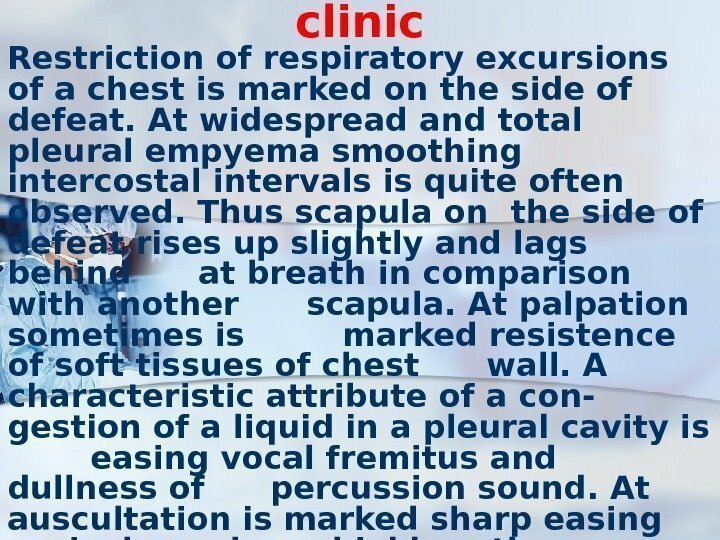 At auscultation is marked sharp easing vesicular or bronchial breath. 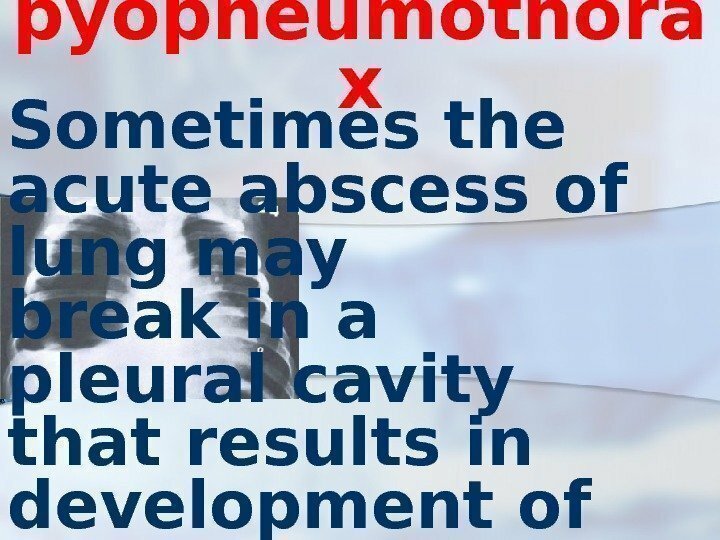 Variegrated moister rattles are listened at empyema, accompanying by destruction of lung tissues more often. 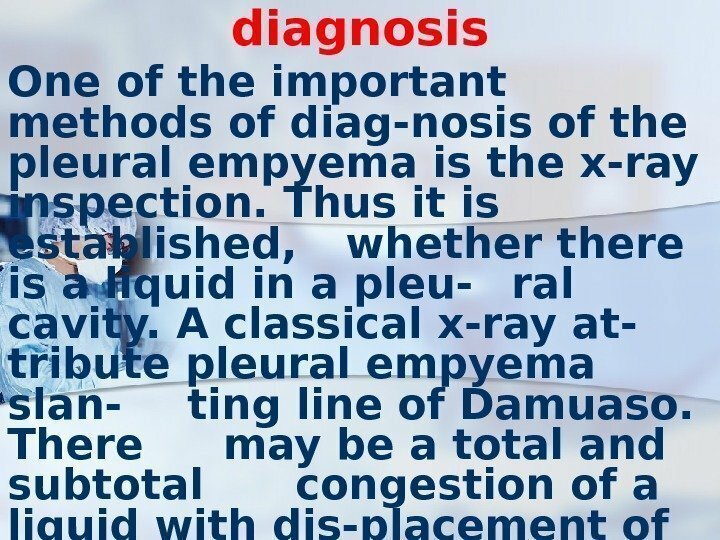 diagnosis One of the important methods of diag-nosis of the pleural empyema is the x-ray inspection. Thus it is established, whethere is a liquid in a pleu- ral cavity. A classical x-ray at- tribute pleural empyema slan- ting line of Damuaso. There may be a total and subtotal congestion of a liquid with dis-placement of mediastinum in the heal-thy side. In some cases it is defined li-mited (incapsulated) liquid. 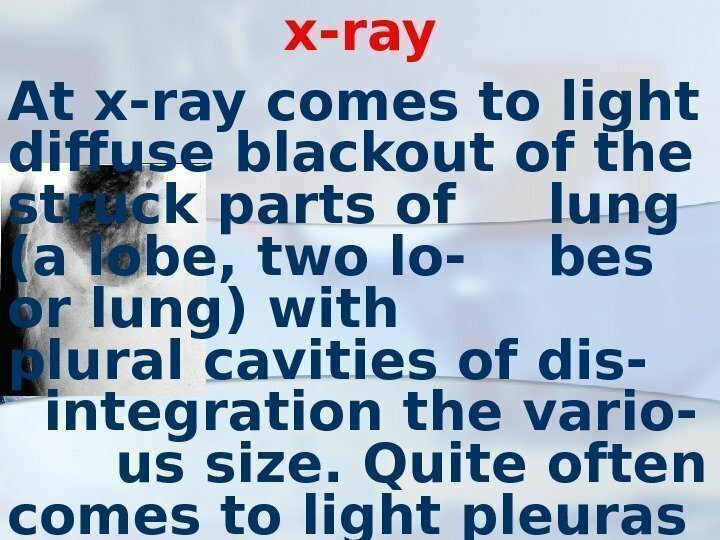 diagnosis Sometimes x-ray research will be carried out in lateroposition (on one side). Also are applied computer tomography and USI. 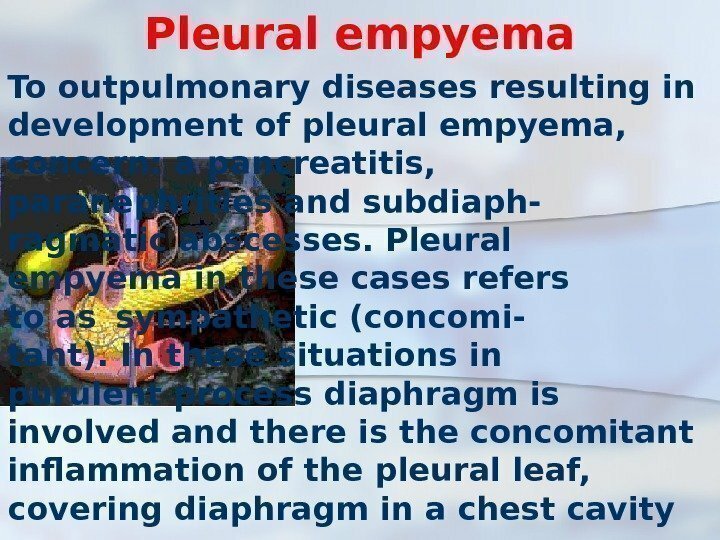 At chronic pleural empyema it is applied bronchography which estimates a condition of a bronchial tree and a degree of com- pressing of lung tissues. 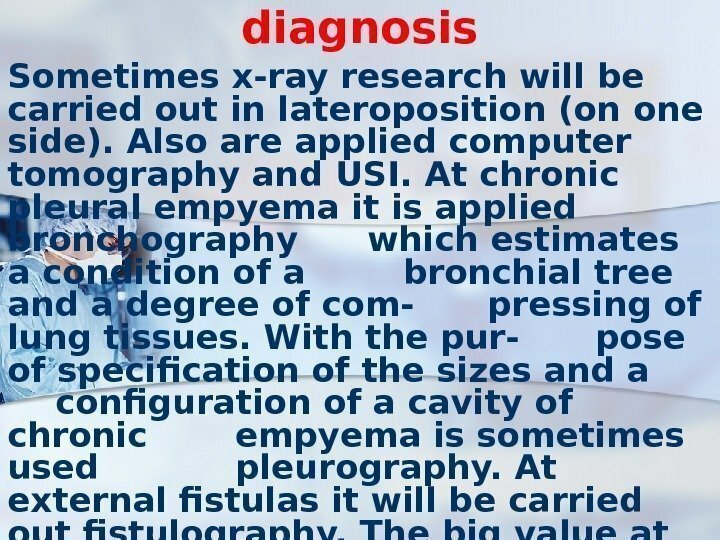 With the pur- pose of specification of the sizes and a configuration of a cavity of chronic empyema is sometimes used pleurography. At external fistulas it will be carried out fistulography. 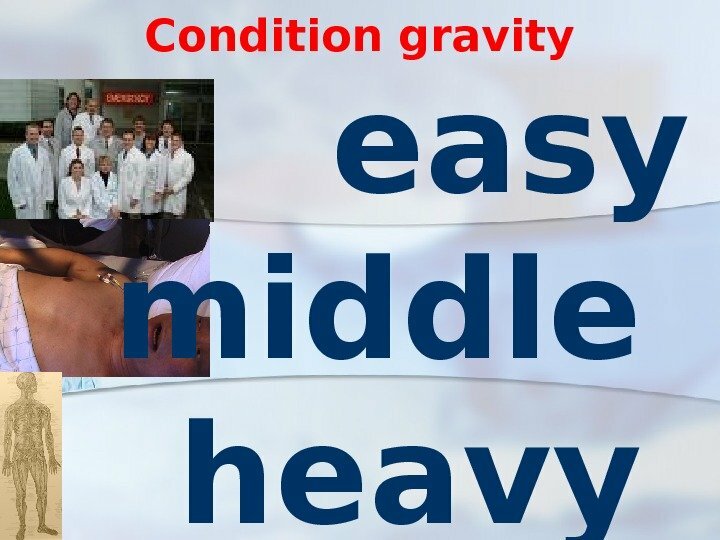 The big value at last years is given to thoracoscopy, which will be carried out also with the medical purpose. 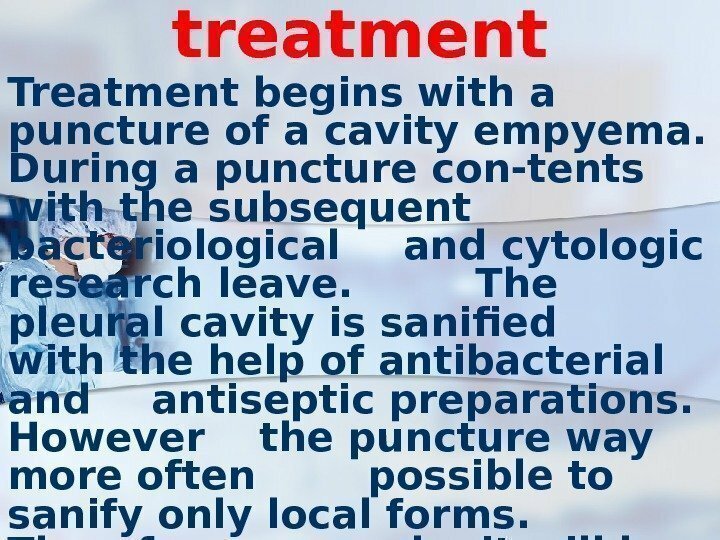 treatment Treatment begins with a puncture of a cavity empyema. During a puncture con-tents with the subsequent bacteriological and cytologic research leave. 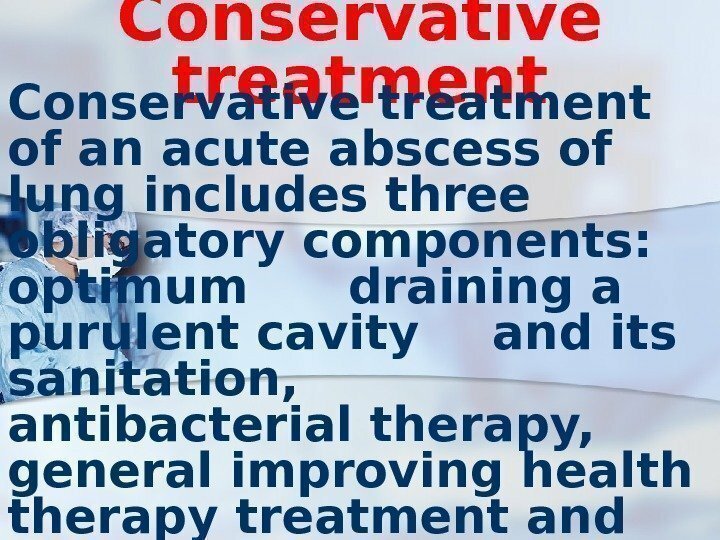 The pleural cavity is sanified with the help of antibacterial and antiseptic preparations. However the puncture way more often possible to sanify only local forms. 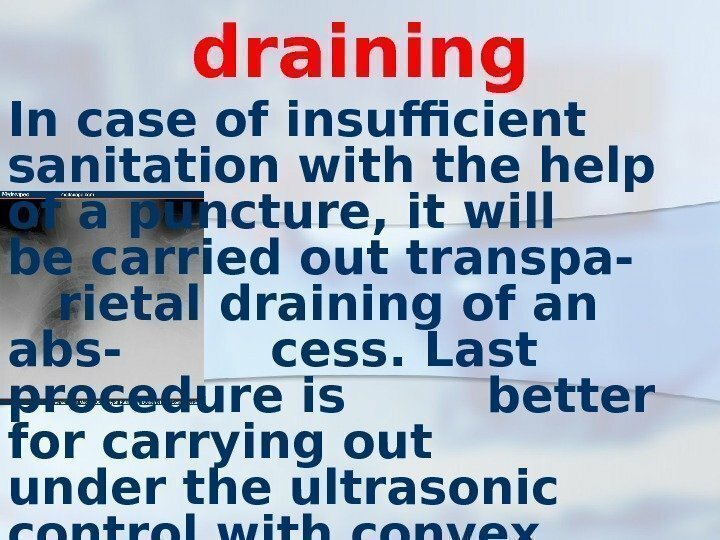 Therefore, as a rule, it will be car-ried out draining a pleural cavity that is better for combining with thoracoscopy. 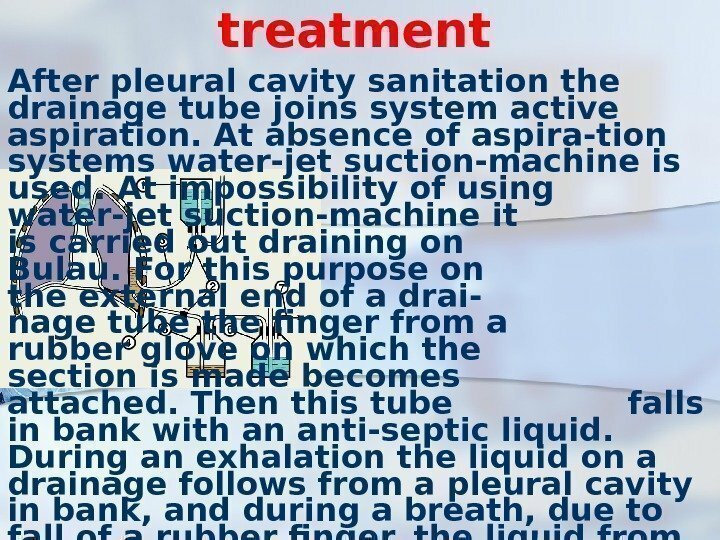 treatment After pleural cavity sanitation the drainage tube joins system active aspiration. At absence of aspira-tion systems water-jet suction-machine is used. At impossibility of using water-jet suction-machine it is carried out draining on Bulau. For this purpose on the external end of a drai- nage tube the finger from a rubber glove on which the section is made becomes attached. Then this tube falls in bank with an anti-septic liquid. 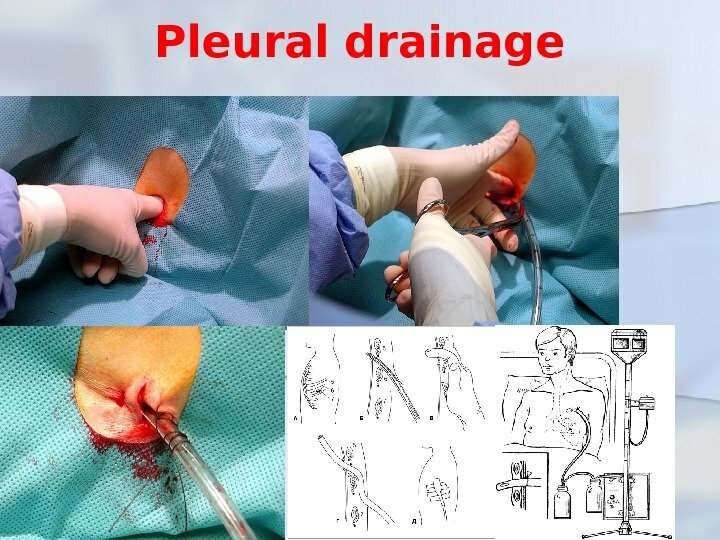 During an exhalation the liquid on a drainage follows from a pleural cavity in bank, and during a breath, due to fall of a rubber finger, the liquid from banks with antiseptic solutions in a pleural cavity does not come back. chronic empyema At chronic empyema pleuras operative treatment is shown. 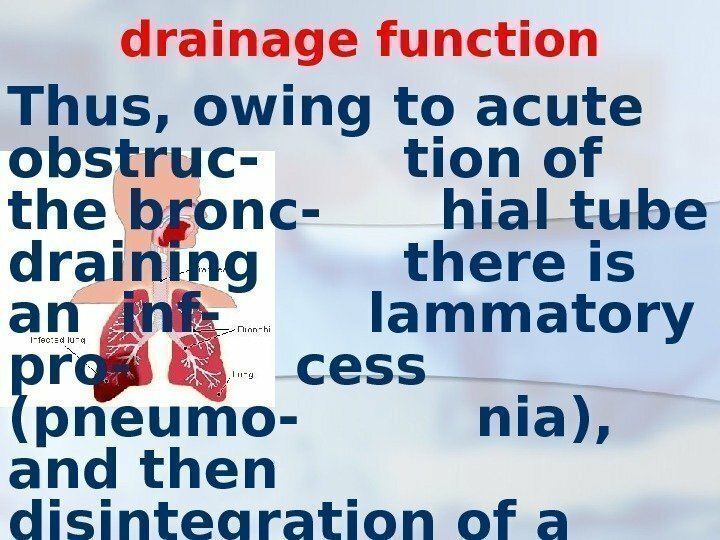 On the form empye- ma and presence of chan- ges from the parts of lung tissues are carried out va- rious operative interventi- ons. 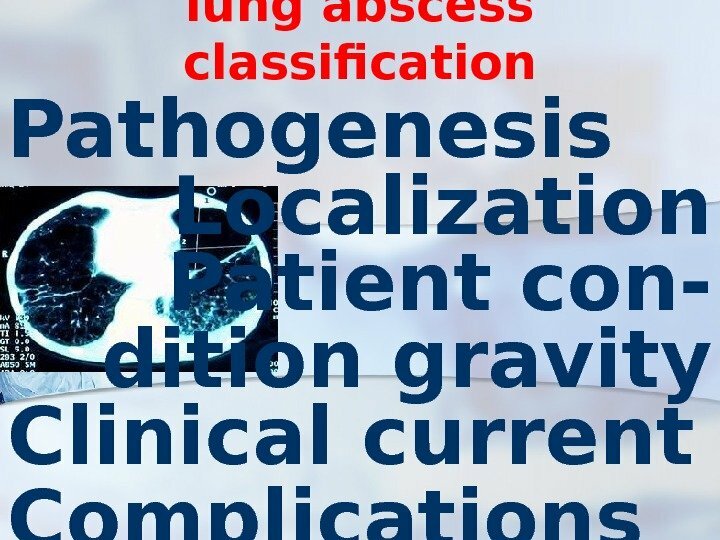 The most widespread operation is pleurectomy and lung decortication. At pleurectomy the bag empyema deletes. The purpose of decortication, offered Delorm in 1894, consists in clearing of lung from cicatricial layer, covering visceral pleura. 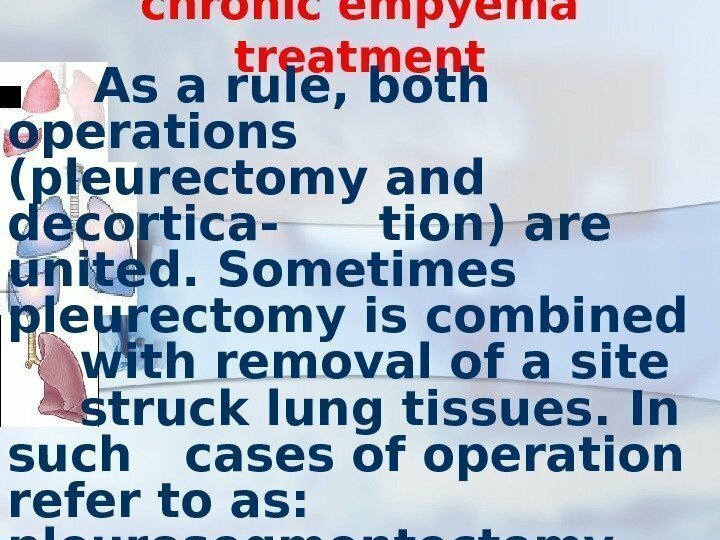 chronic empyema treatment One of the most hardest operative interventions is pleuropulmonectomy. 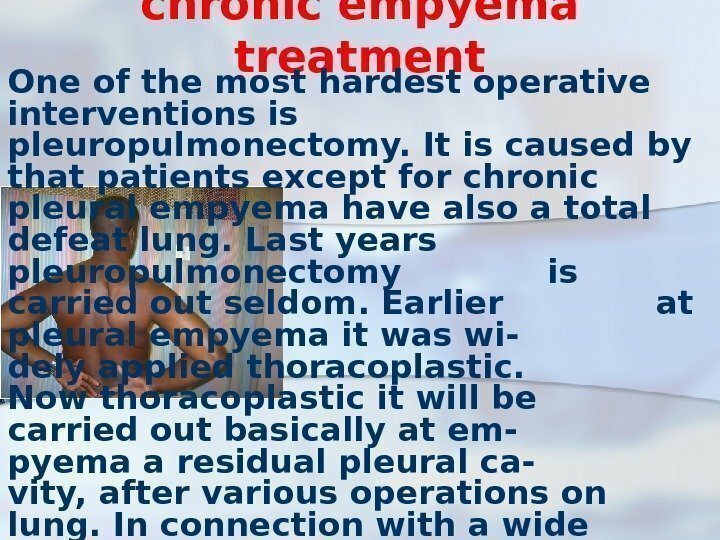 It is caused by that patients except for chronic pleural empyema have also a total defeat lung. Last years pleuropulmonectomy is carried out seldom. 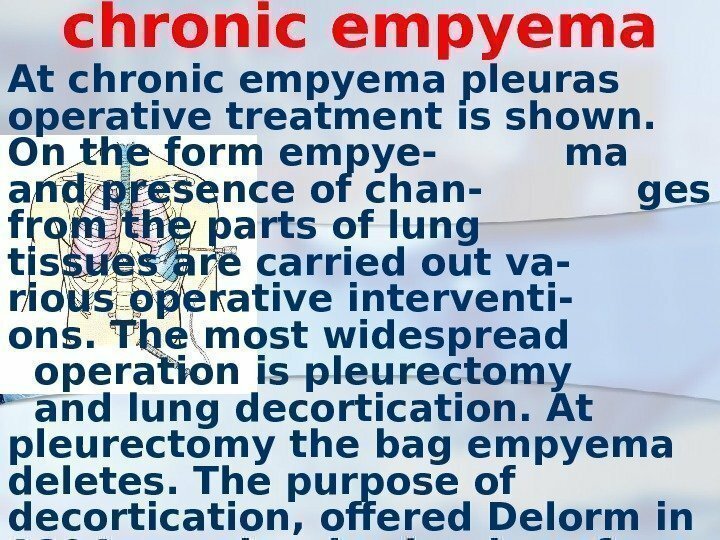 Earlier at pleural empyema it was wi- dely applied thoracoplastic. 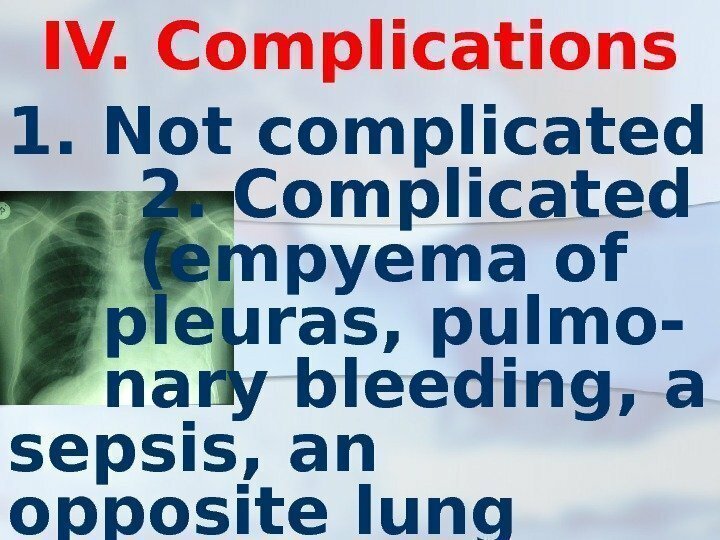 Now thoracoplastic it will be carried out basically at em- pyema a residual pleural ca- vity, after various operations on lung. 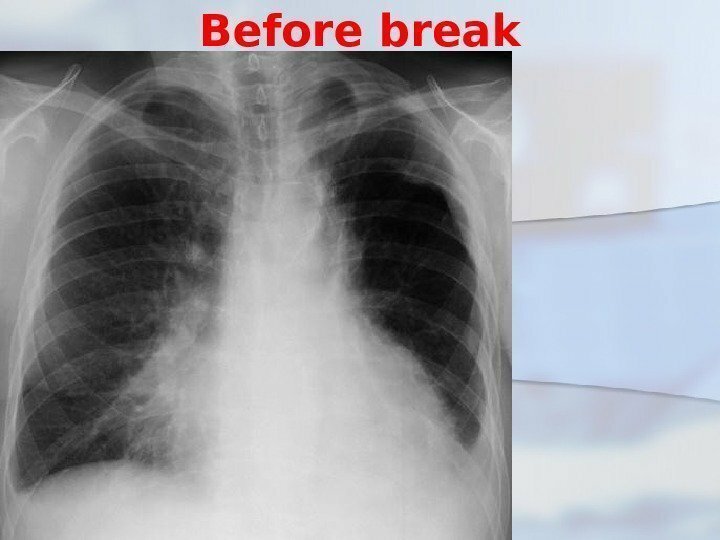 In connection with a wide circulation lung surgeries complication as empyema a residu-al pleural cavity after removal of a part or all of lung has appeared. 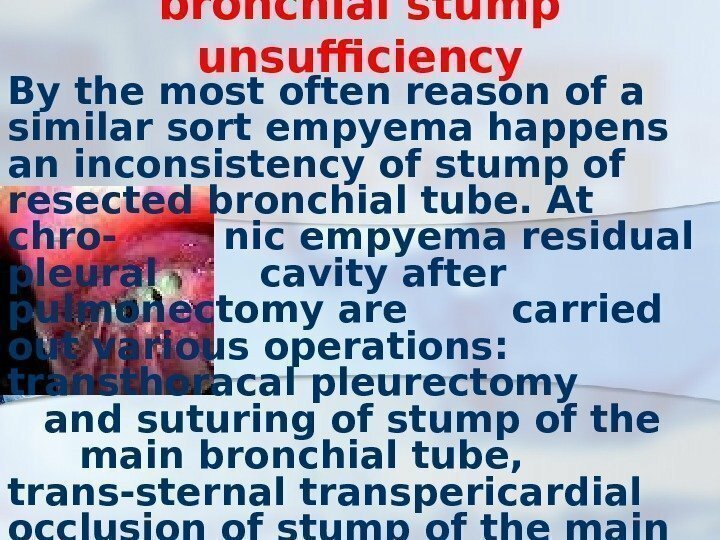 bronchial stump unsufficiency By the most often reason of a similar sort empyema happens an inconsistency of stump of resected bronchial tube. At chro- nic empyema residual pleural cavity after pulmonectomy are carried out various operations: transthoracal pleurectomy and suturing of stump of the main bronchial tube, trans-sternal transpericardial occlusion of stump of the main bronchial tube and various kinds of thoraco-plastic. 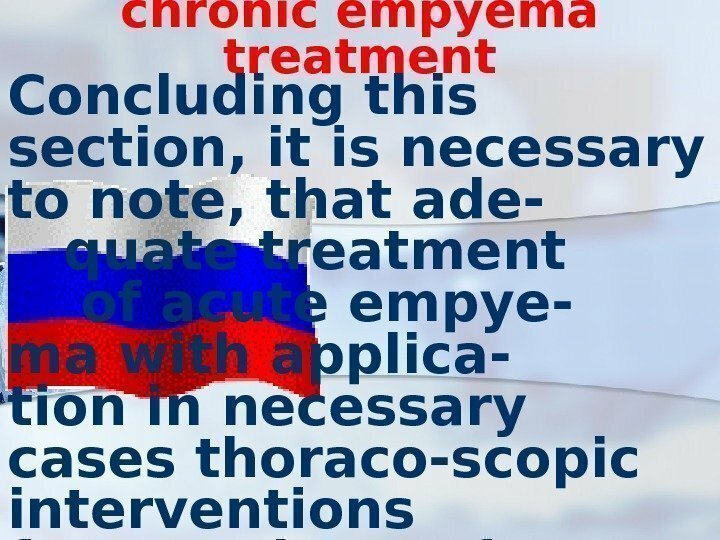 chronic empyema treatment Concluding this section, it is necessary to note, that ade- quate treatment of acute empye- ma with applica- tion in necessary cases thoraco-scopic interventions frequently results pleuras in recovery. 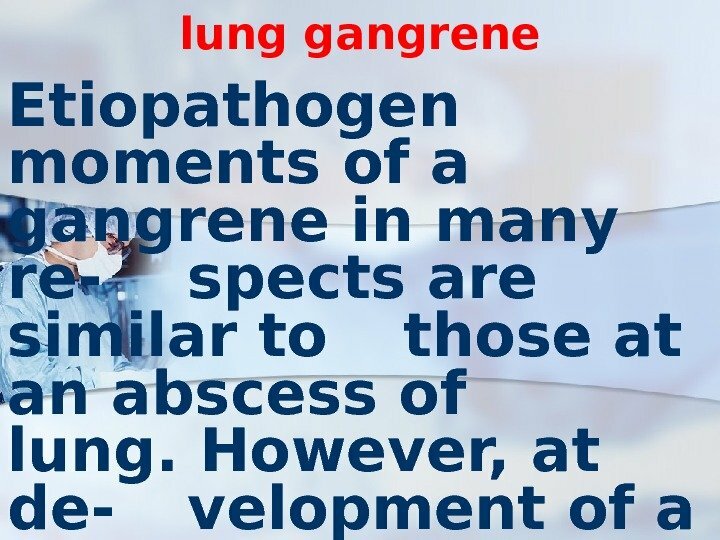 lung gangrene Etiopathogen moments of a gangrene in many re- spects are similar to those at an abscess of lung. However, at de- velopment of a gang-rene they are expressed in an extreme degree. 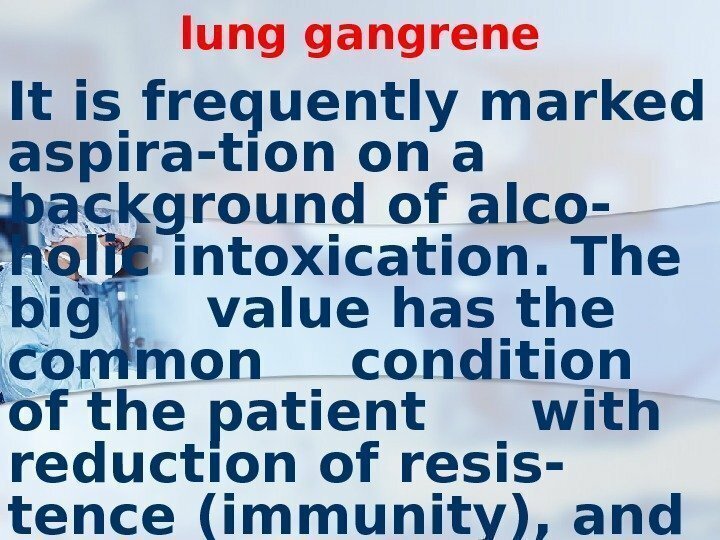 lung gangrene It is frequently marked aspira-tion on a background of alco- holic intoxication. 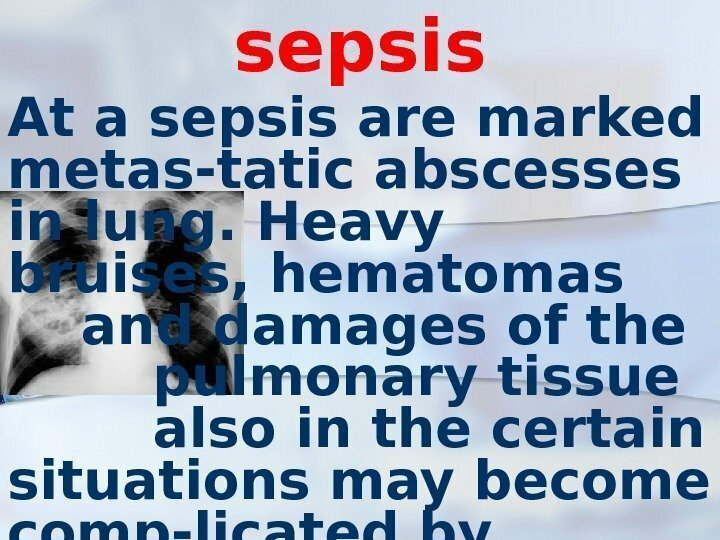 The big value has the common condition of the patient with reduction of resis- tence (immunity), and al-so heavy accompanying disea-ses (a diabetes etc. ). 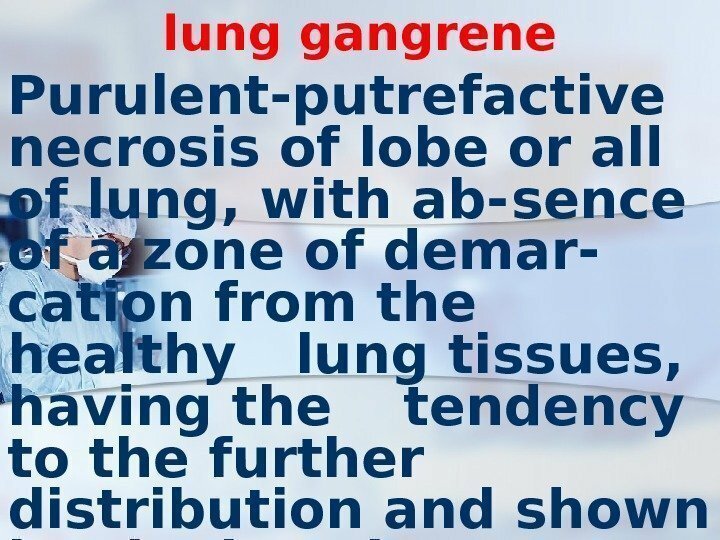 lung gangrene The significant role is played with previous chronic non- specific diseases of lung. 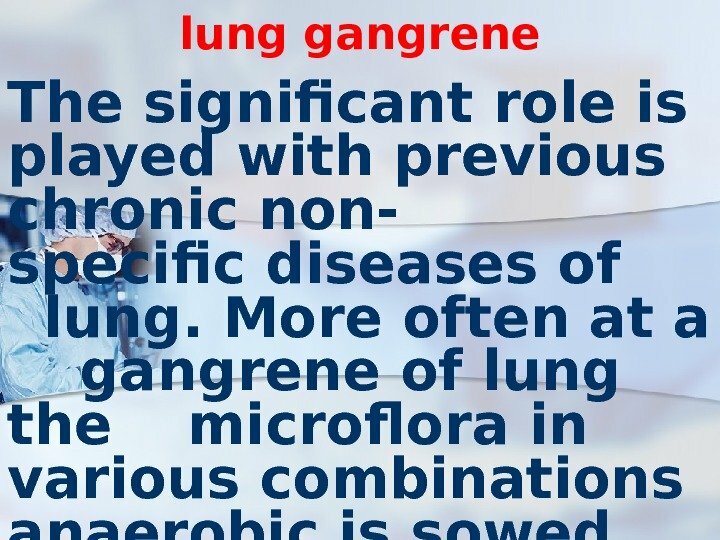 More often at a gangrene of lung the microflora in various combinations anaerobic is sowed with aerobic. 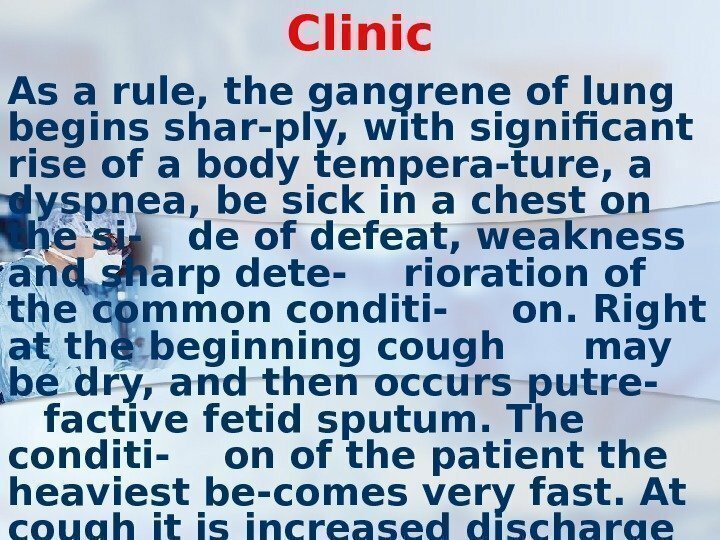 Clinic As a rule, the gangrene of lung begins shar-ply, with significant rise of a body tempera-ture, a dyspnea, be sick in a chest on the si- de of defeat, weakness and sharp dete- rioration of the common conditi- on. Right at the beginning cough may be dry, and then occurs putre- factive fetid sputum. The conditi- on of the patient the heaviest be-comes very fast. 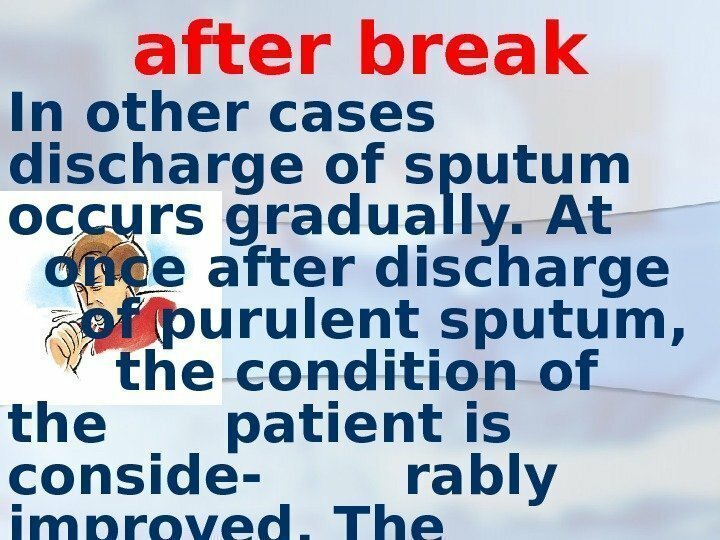 At cough it is increased discharge purulent sputum which has dirty-grey, greenish or (from an impurity of blood) chocolate color. 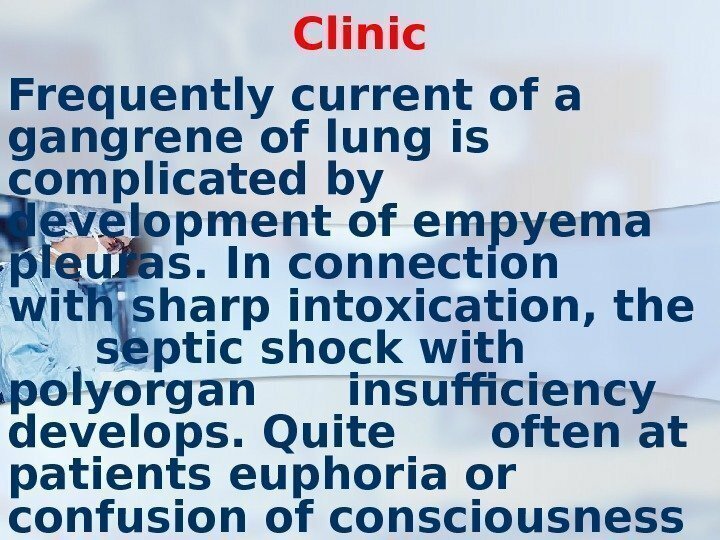 Clinic Frequently current of a gangrene of lung is complicated by development of empyema pleuras. 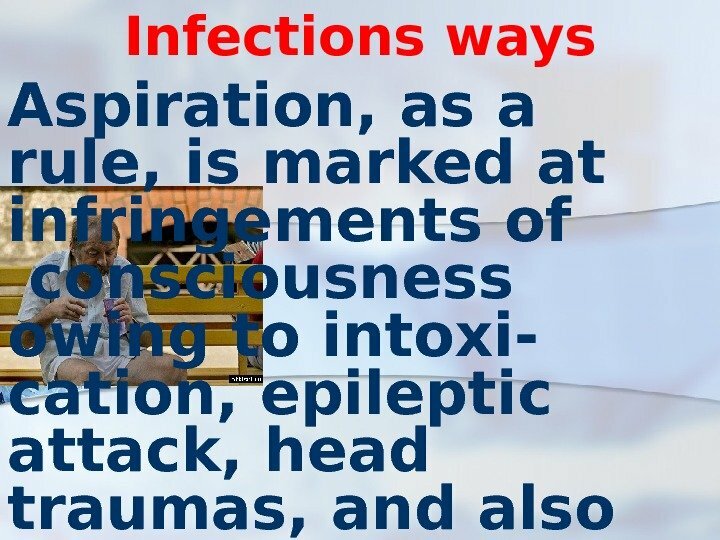 In connection with sharp intoxication, the septic shock with polyorgan insufficiency develops. Quite often at patients euphoria or confusion of consciousness is marked. Integuments of pale-grayish color with expressed acrocyanosis. 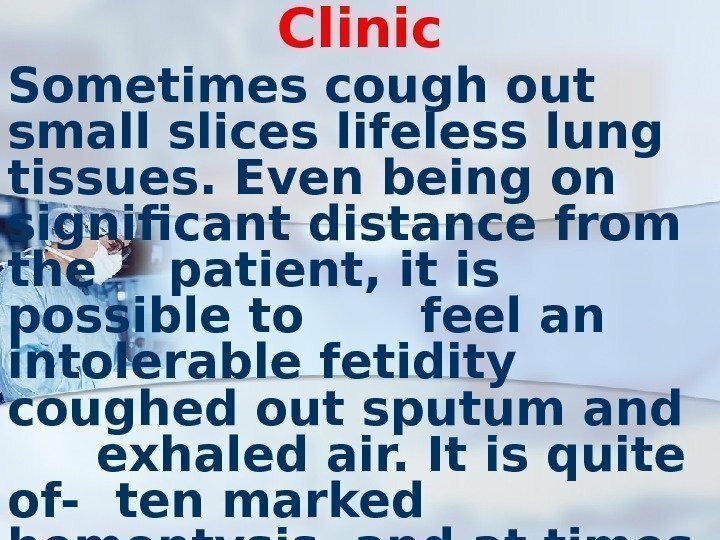 Clinic At percussion zones of dullness above lung are quickly increased. On a back- ground of dullness there may be the sites of a high sound signi- ficative of formation of cavities of disinte- gration. In the begin- ning at auscultation breath weakened, and then becomes bronchial. Then dry and damp variegra-ted rattles are listened. prognosis The prognosis at a lung gangrene frequently adverse. 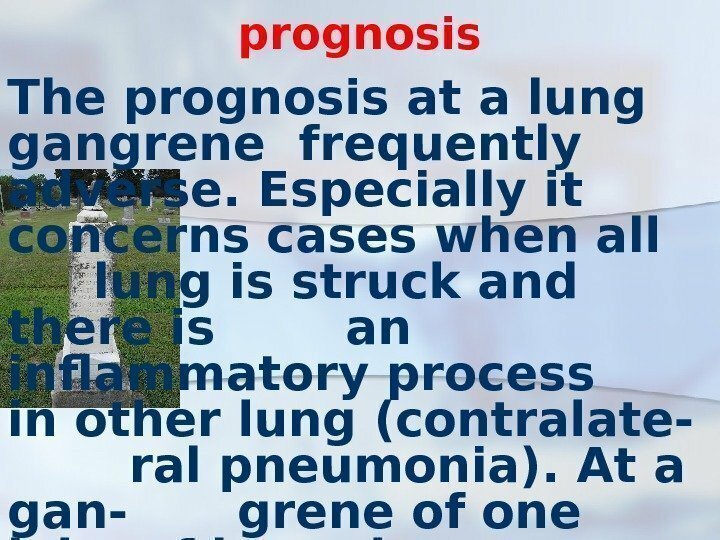 Especially it concerns cases when all lung is struck and there is an inflammatory process in other lung (contralate- ral pneumonia). At a gan- grene of one lobe of lung the prognosis is more often more favorable. 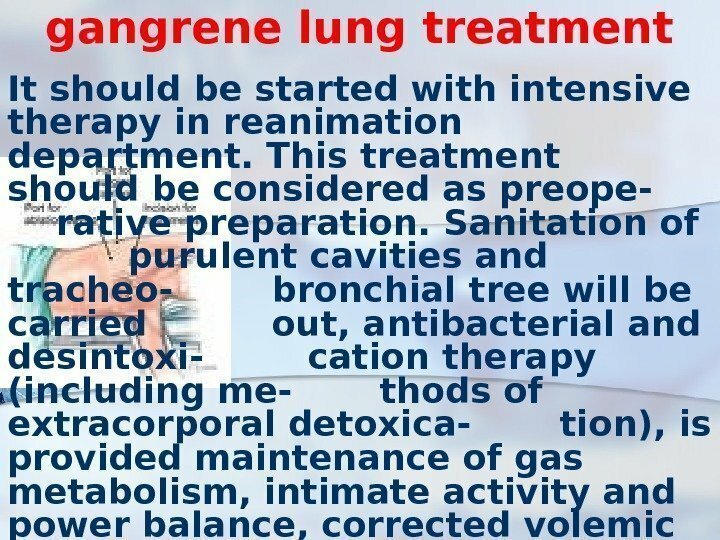 gangrene lung treatment It should be started with intensive therapy in reanimation department. 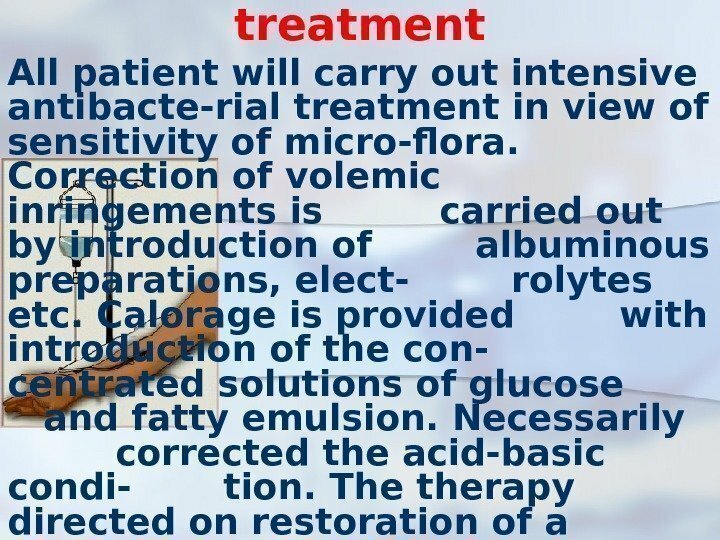 This treatment should be considered as preope- rative preparation. 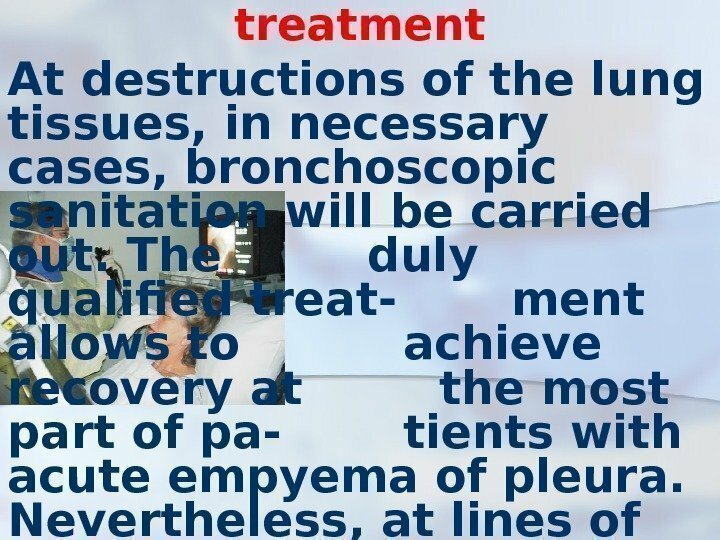 Sanitation of purulent cavities and tracheo- bronchial tree will be carried out, antibacterial and desintoxi- cation therapy (including me- thods of extracorporal detoxica- tion), is provided maintenance of gas metabolism, intimate activity and power balance, corrected volemic and immune infrin-gements, and also other frustration of metabo-lism. 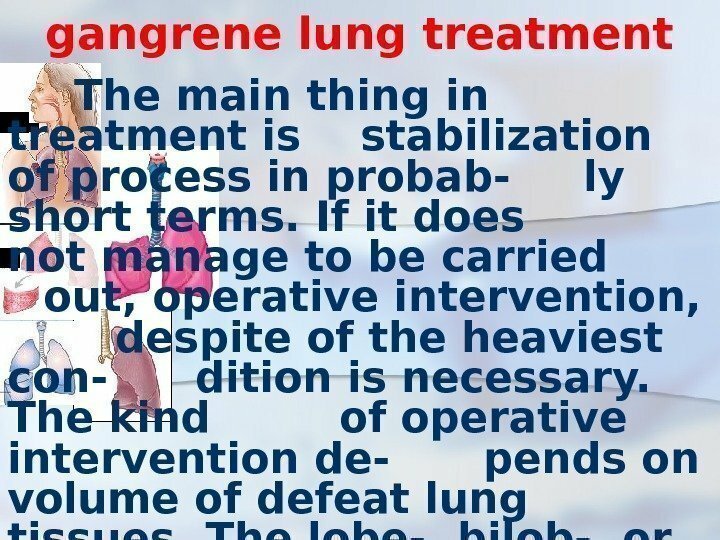 gangrene lung treatment The main thing in treatment is stabilization of process in probab- ly short terms. 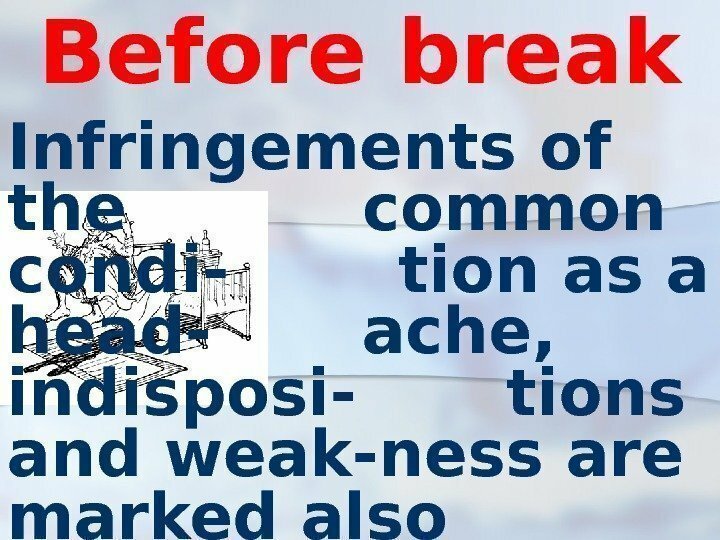 If it does not manage to be carried out, operative intervention, despite of the heaviest con- dition is necessary. The kind of operative intervention de- pends on volume of defeat lung tissues. The lobe-, bilob-, or pul-monectomy is carried out.